Landing number 2079; A Landing A Day blog post number 507. And I know this why? 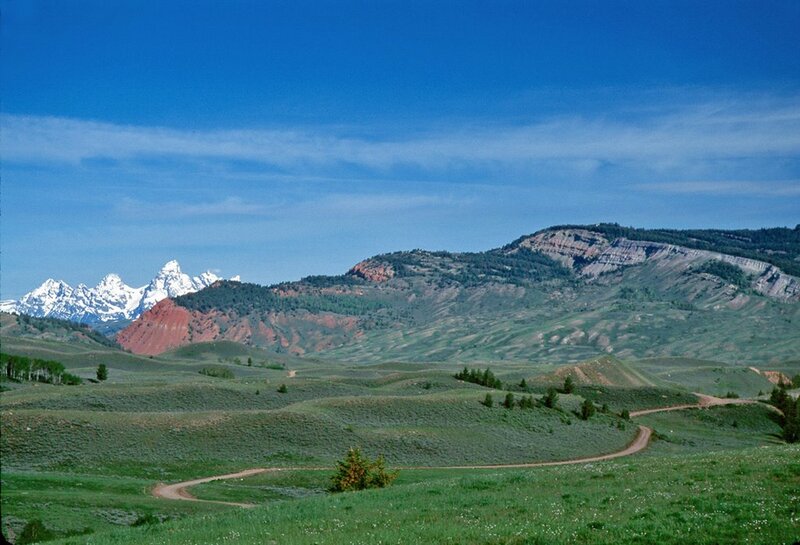 Because the SE quadrant of Utah is one of the most beautiful pieces of real estate on the planet. OK, so I have to do a little math. 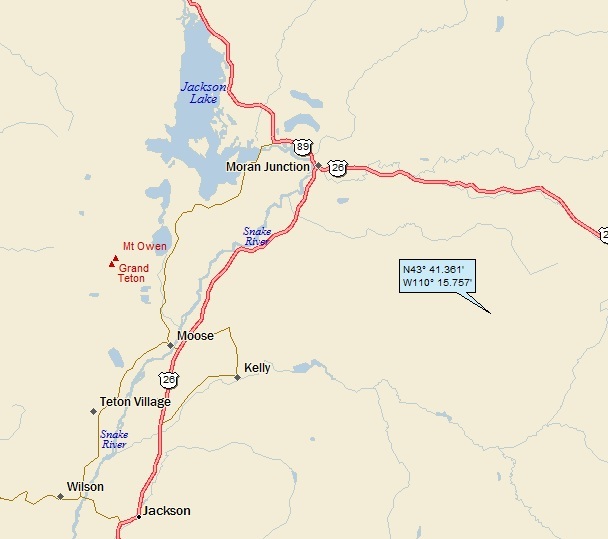 The latitude difference is actually about 2.56 degrees. 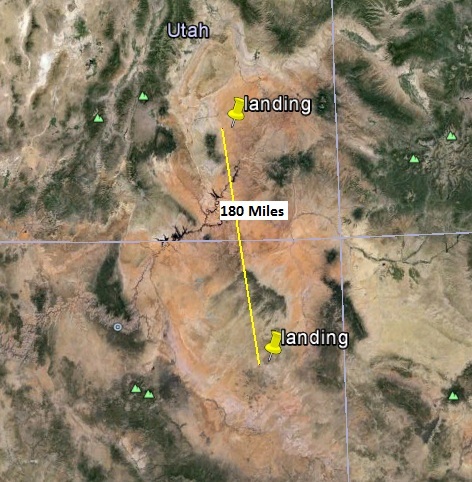 My landings are about 180 miles apart. That means each degree of latitude (at least locally) equals about 180 miles / 2.56 degrees = about 70 miles/degree. This little analysis fits into the “just in case you want to know” category. 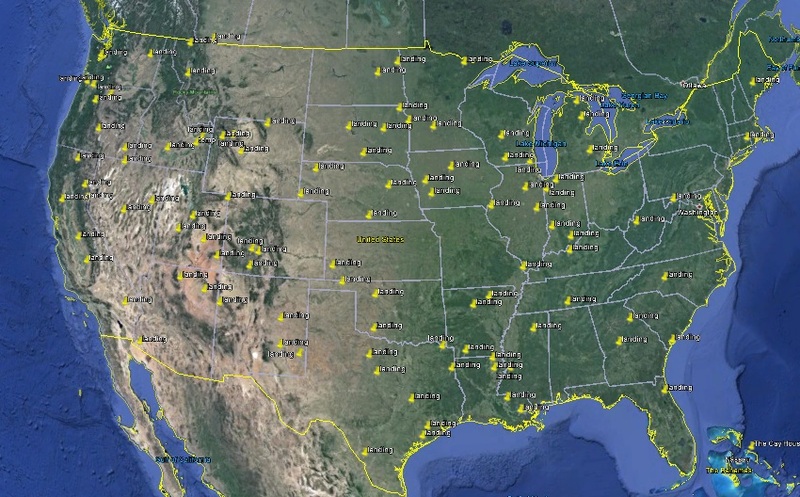 Check out the contiguous block of states with no landings: OH, PA, NJ, DE, RI, MD, VA, NY, MA, VT and NH! Adding up the areas, I get about 234,000 square miles. 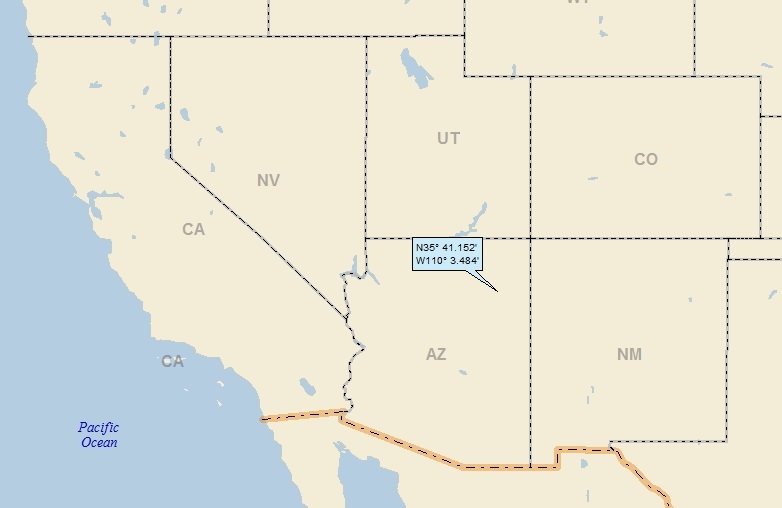 That’s way bigger than CA (164,000 sq mi), and CA has 7 landings already! 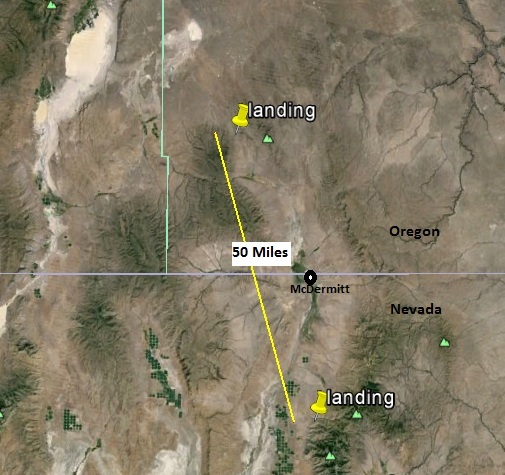 It’s almost as big as TX (269,000 sq mi) and TX also has 7 landings! Maybe you can see why I go a little crazy with the USer & OSer thing. The eastern block of states has a total area of 694,000 square miles. 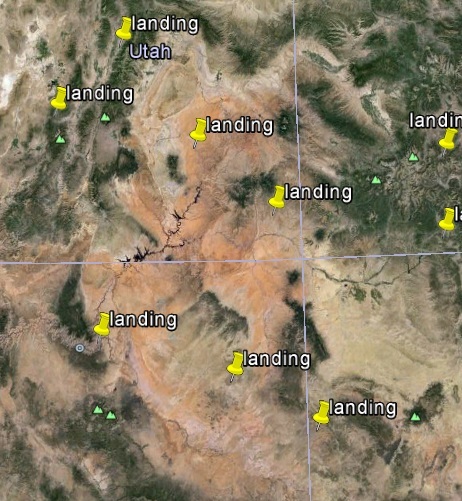 I’ve landed there 13 times, for an average landing density of (694,000/13), which equals one landing for every 53,400 square miles. Let’s check out the western block of states. It’s much bigger, with a total area of about 2,368,000 square miles. But I’ve landed there way more often, 91 times. 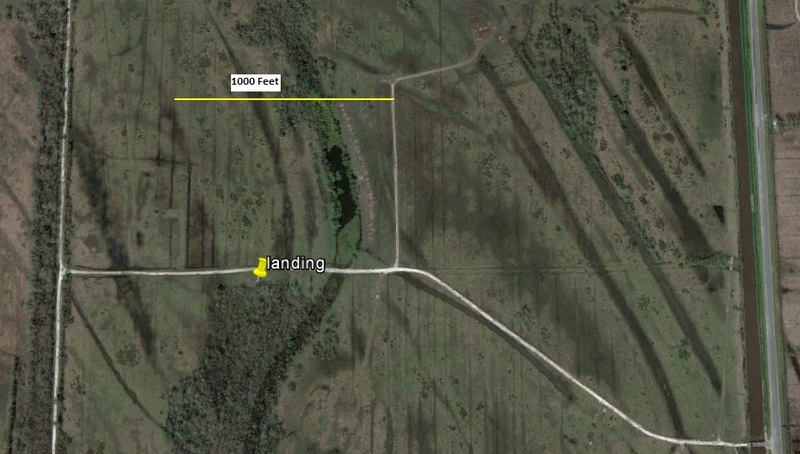 This works out to an average of one landing for every 26,000 square miles. Look at that! 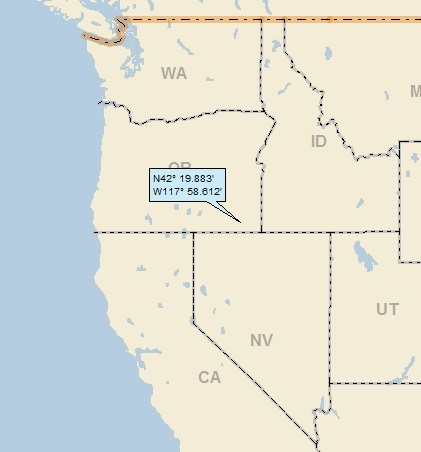 My landing density is twice as high for the western states as for the eastern. Go figure . . . If you’re saying to yourself something like “maybe Greg’s random landing program isn’t so random,” I can only answer that it absolutely is! 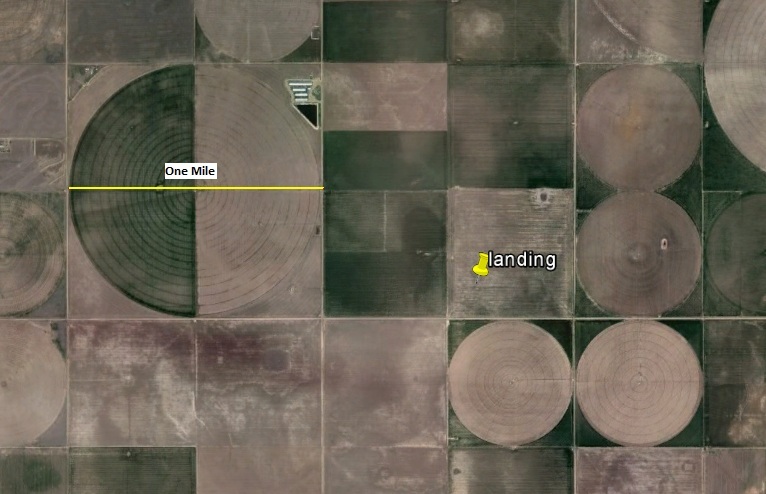 For those who could care less about landing densities, my apologies. It’s time to get back to today’s landing . . .
How about Hanksville? 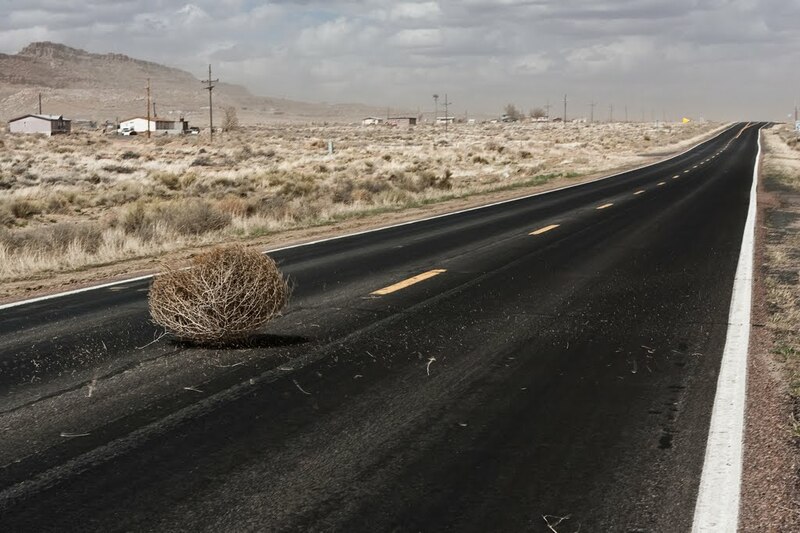 Well, there’s not much. Wiki tells me that this was a Mormon settlement (surprise, surprise) founded in 1882 and named after one of the Mormon leaders, Ebenezer Hanks. It has some mining history, but has settled into being a tourist destination, or at least a sight-seeing base of operations. I chanced upon a blog posting that is definitely within range of this landing. In fact, it is so outstanding, I absolutely insist that all of my readers visit it. 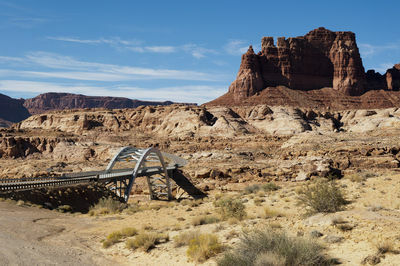 The name of the blog is “Embedded in Academia” (it’s written by a John Regehr, a U of U computer science professor) and the post title is “Around Hanksville Utah.” It’s a travelogue about a father and sons weekend trip to Hanksville. It does a better job than I could ever do talking about (and showing pictures of) the absolutely awesome landscapes around Hanksville. He has many, many more great shots. Click HERE to get to it. Now that you’ve read (and enjoyed) my guest blogger’s post, I really don’t have much to do! Landing number 2078; A Landing A Day blog post number 506. Dan – This is actually getting serious. Yet another OSer (six of my last seven landings), and my Score is back up to 150! This is my 10th landing since originally breaking the 150 barrier. Haven’t a clue what I’m talking about? Click HERE. 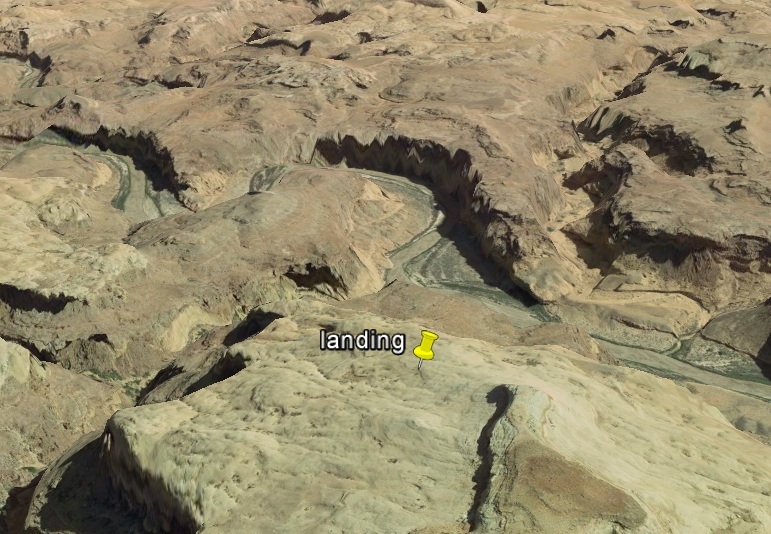 You’re probably a little surprised as to why the post is entitled “First Mesa.” Well, let me start with a Google Earth (GE) shot showing the same area as the above landing map. Pretty cool eh? By the way, the blue dot is the little “hand” on GE that grabs the photo and pulls it forward. Why it’s a blue dot instead of the little hand, I have no clue. Anyway, now that I’ve downloaded a video screen capture app and know how to do this, this may become a regular feature for future posts. 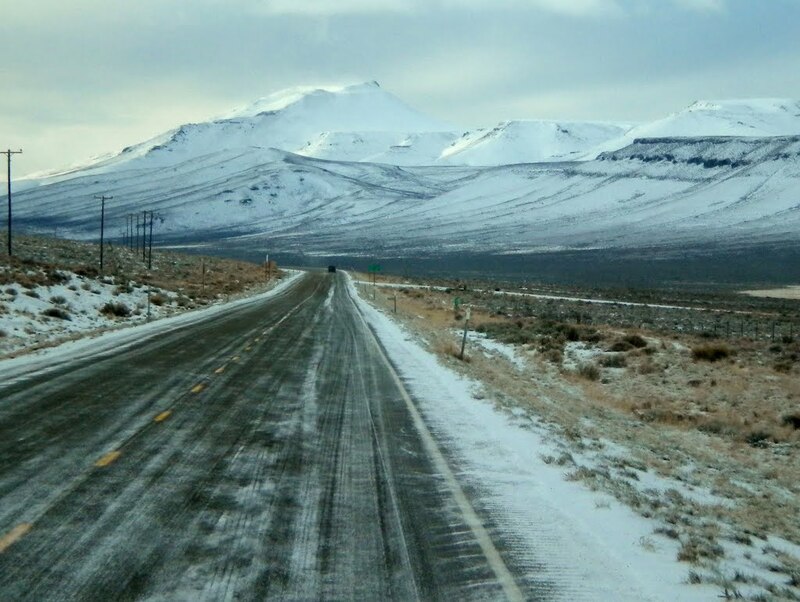 . .
Wow: Snow in the desert! The gap in the rocks to the right is my landing valley . . . I was able to follow this little tributary downstream to another little tributary, and then to another, all heading southwest. 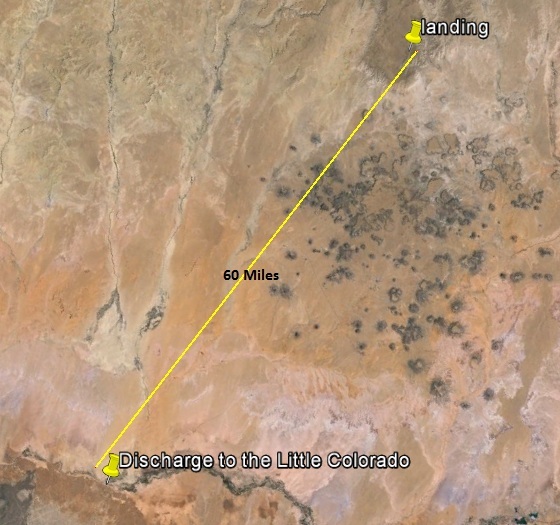 Eventually, 60 miles later, I found the discharge point into the Little Colorado River (17th hit); on to the Big Colorado River (165th hit; third on my list after the Mississippi & the Missouri). Here’s a GE shot showing the miles of desert my runoff would have to cross in order to reach the Little Colorado (which, trust me, never happens). 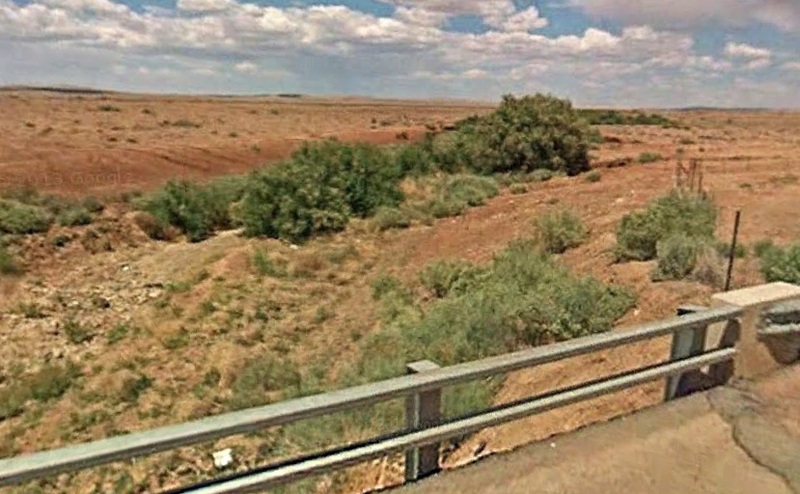 While I didn’t read anything about the geologic particulars of First Mesa, I happen to know that mesas in general are elevated erosional remnants (underlain by flat-lying bedrock), protected and maintained by a caprock that is particularly resistant to erosion (like sandstone). The populated portion with the three villages is off to the far left. 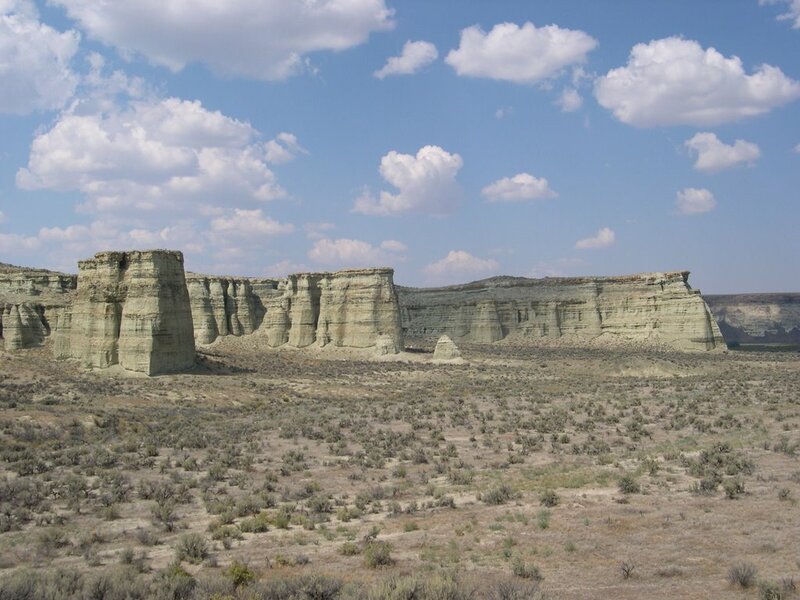 The mesa has a topographic dip that separates the inhabited portion from a much larger, broader portion of the mesa. 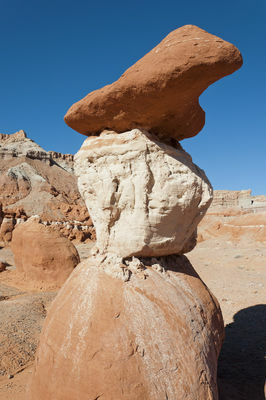 The purpose of this photo is to show you the caprock that is resistant to erosion and is the raison d’etre of the mesa. Not too obvious, eh? 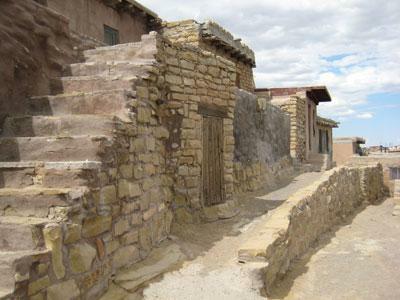 First Mesa is the home of historic Walpi Village, continuously inhabited for more than 1100 years. Walpi stands above the valley at 300 feet, surrounded by awesome vistas of the sky and distant horizons. 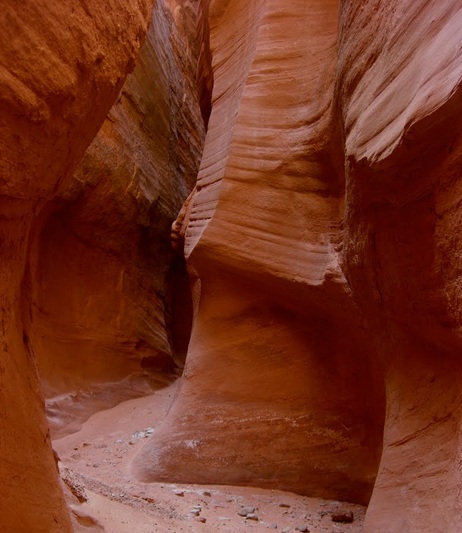 Walpi is the most inspiring places in Arizona. 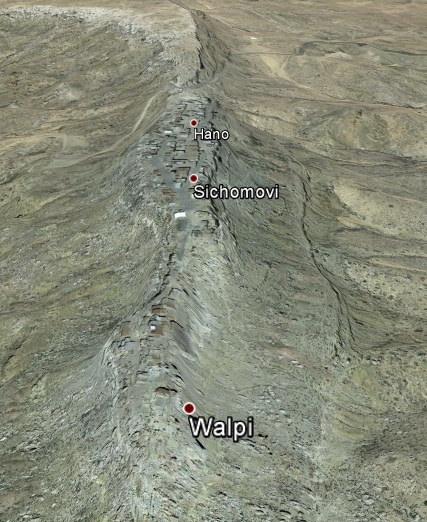 Sharing First Mesa with Walpi are the villages of Sichomovi and Tewa (Hano), both established in the late 1600s. 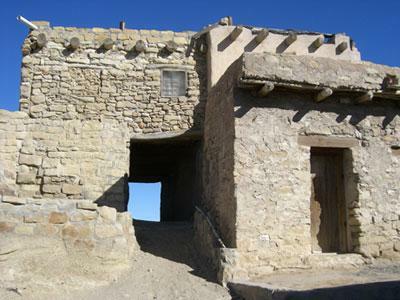 On a guided walking tour (provided by a local tourism program) you will learn about the history of the first community “founded” at First Mesa, Walpi Village, which dates back to about 900 A.D., long before the first non-Natives landed on the shores of what is now North America. 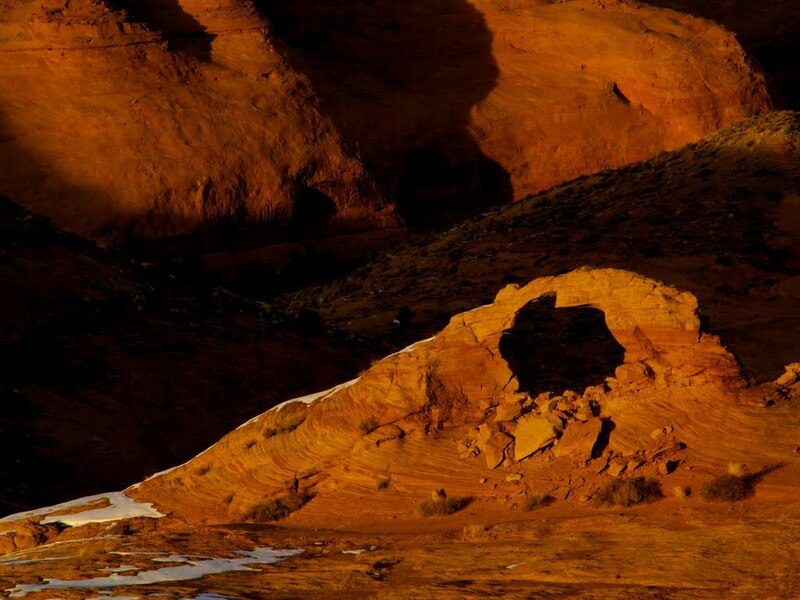 In 1540, the Spaniard Pedro de Tovar made contact with the Hopi in his search for the seven cities of gold. An estimated 2,000 people occupied Walpi at this time. 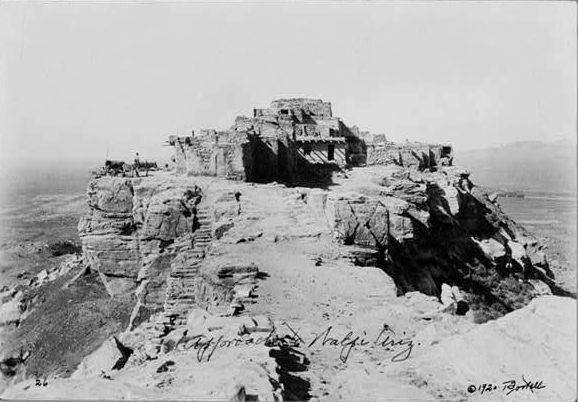 The Spanish established missions in the Hopi Villages and began conversion to the foreign Christianity. 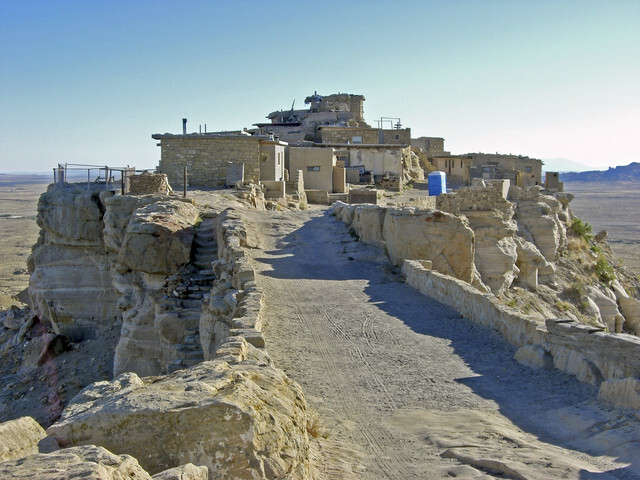 In 1680, the Pueblo people of present-day southwestern United States revolted and drove the missionaries from their homelands. 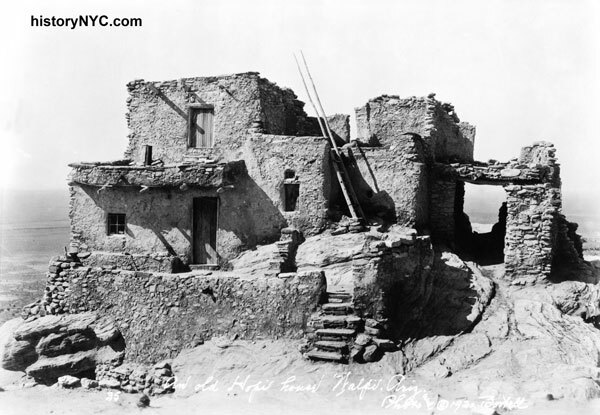 For centuries thereafter, missions were not reestablished among the Hopi. 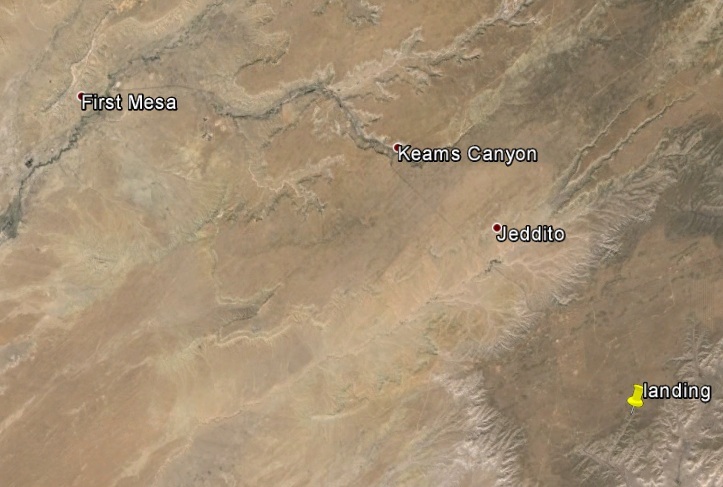 After the revolt of 1680, two other villages were established on First Mesa: Sichomovi and Hano (Tewa). 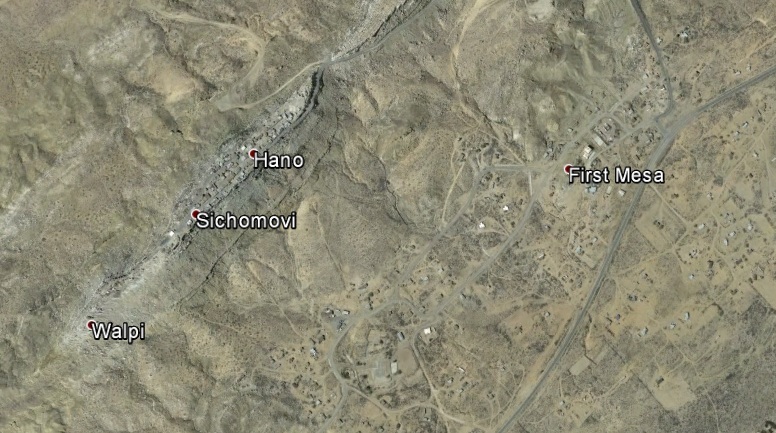 Sichomovi village was settled by people of Walpi. Hano was originally settled by a group known as the Hano people. 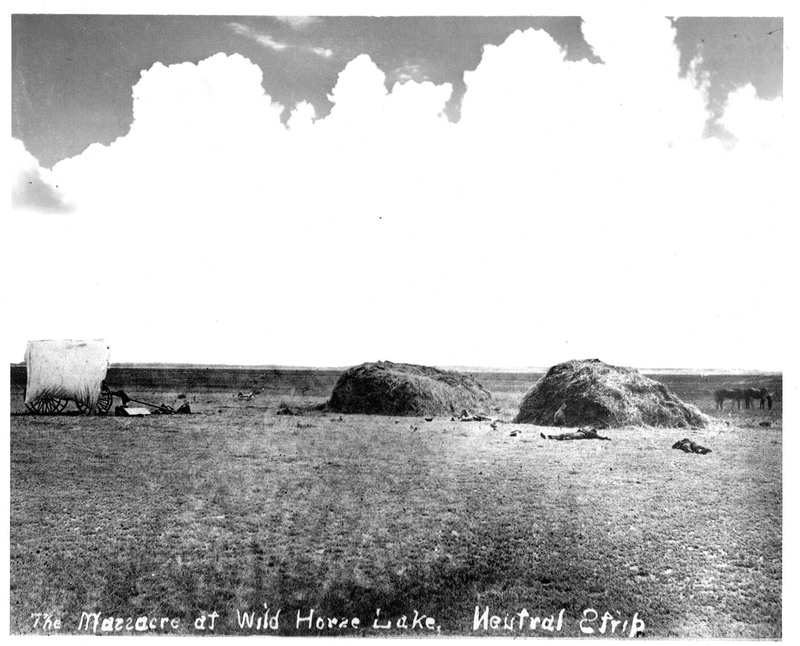 When they abandoned the site of Hano, it was resettled by the Tewa who came from present-day New Mexico. 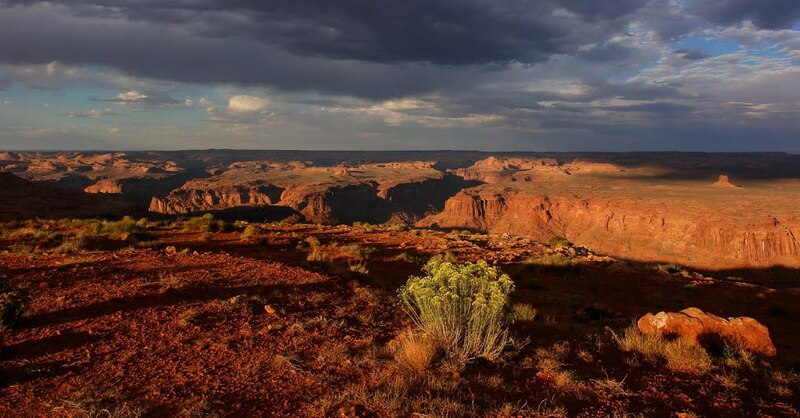 Amazingly, the people living atop this small mesa still retain separate languages after 600 years. 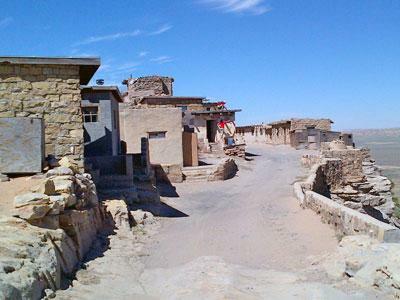 The village of Walpi is a living village where the homes are passed down through matrilineal clan lineage. Just as it has been over the centuries, there is no electricity or running water in the old village of Walpi. 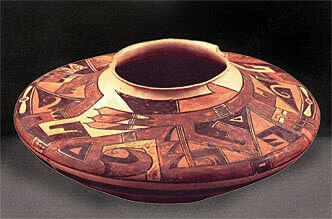 First Mesa is known for the finest polychrome pottery and kachina doll carvings. 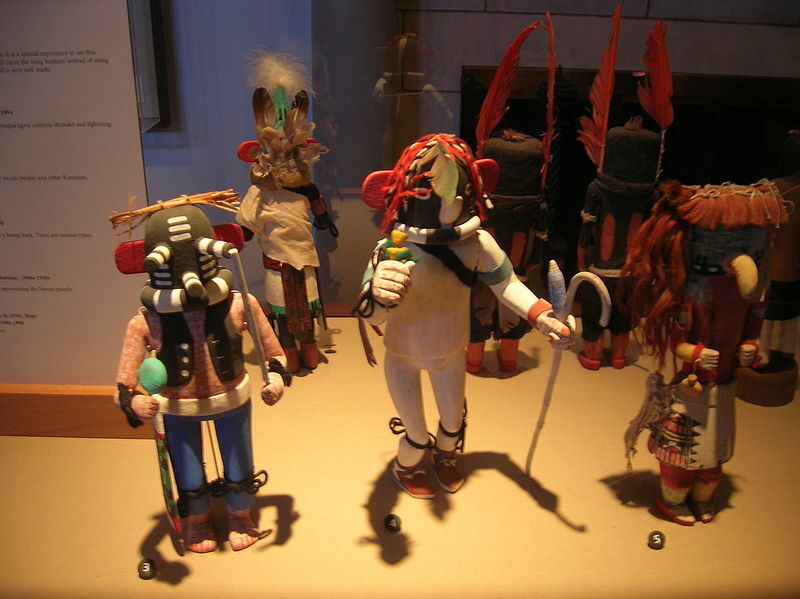 Kachinas are spirits or personifications of things in the real world. A kachina can represent anything in the natural world from a revered ancestor to a location, a quality, a natural phenomenon, or a concept. 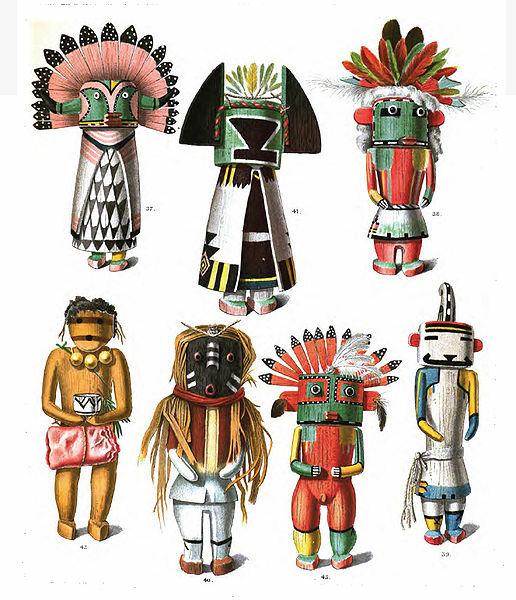 There are more than 400 different kachinas in Hopi and Pueblo culture. The local pantheon of kachinas varies in each pueblo community; there may be kachinas for the sun, stars, thunderstorms, wind, corn, insects, and many other concepts. Landing number 2077; A Landing A Day blog post number 505. Dan – Oh my. 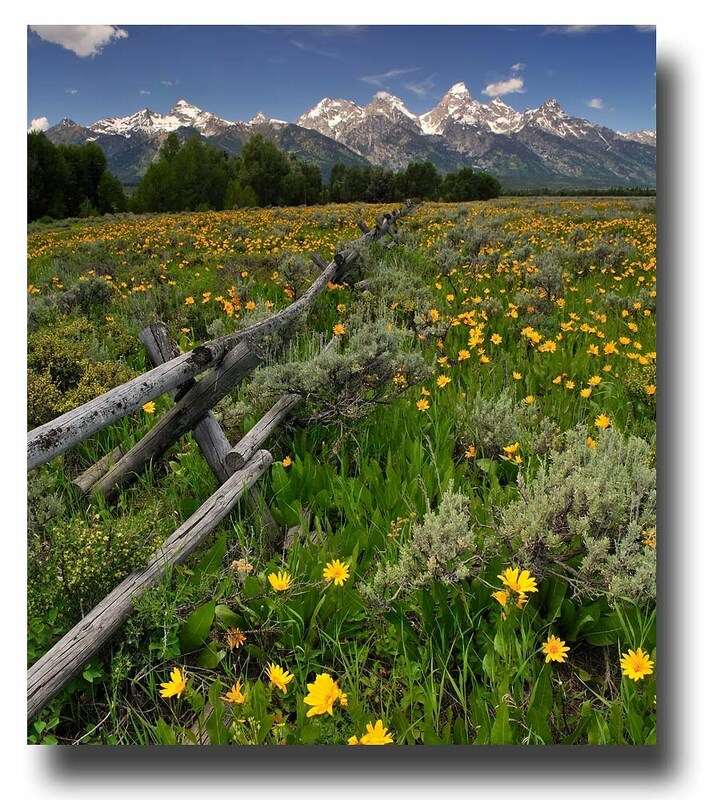 I know, Dan, that you read my previous Jackson Hole WY post, and are looking forward to reading this Jackson Hole (Part 2) post. 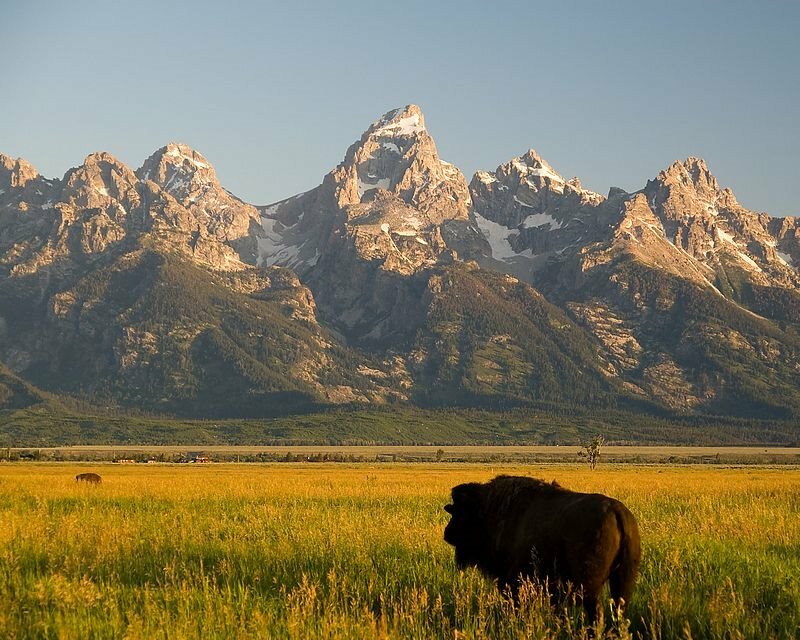 Anyone else who hasn’t read my first Jackson Hole post, you must click HERE to read it. When you’re done, come right on back! 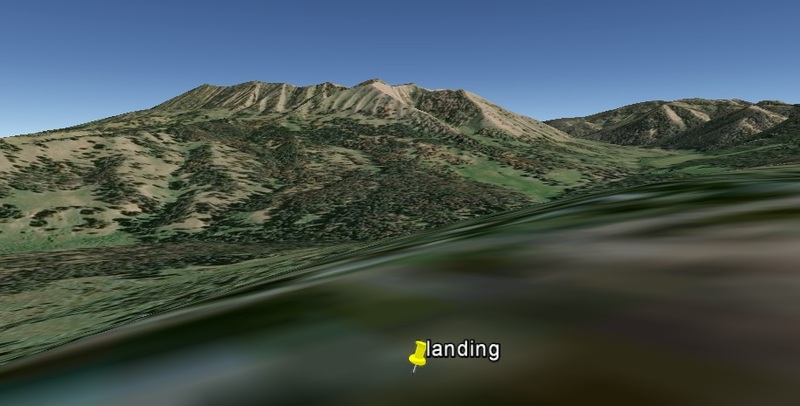 You can see that I landed about 13.5 miles from “Lower Slide Lake.” Hmmm, unusual name, eh? 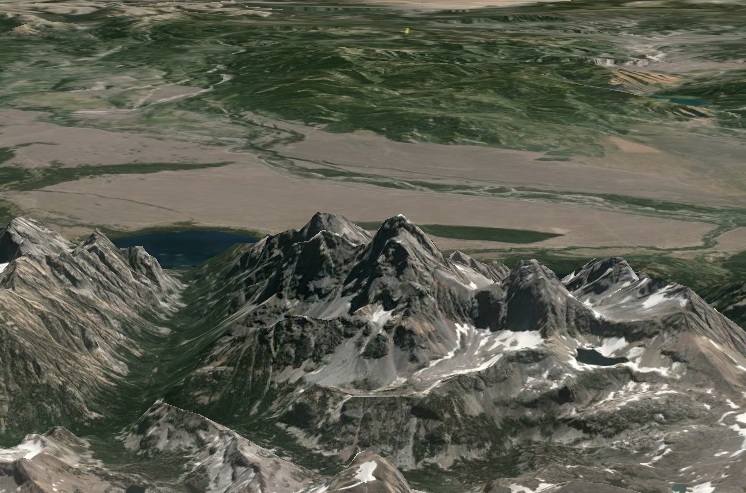 Lower Slide Lake is located in Bridger-Teton National Forest, in the U. S. state of Wyoming. 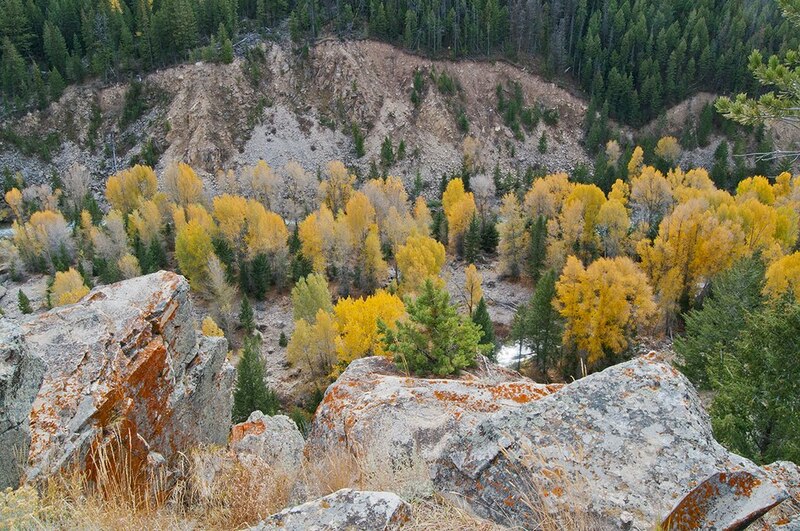 The natural lake was created on June 23, 1925 when the Gros Ventre landslide dammed the Gros Ventre River. The lake was once much larger; however part of the rock dam failed less than two years later (on May 18, 1927) causing deadly flooding downstream. 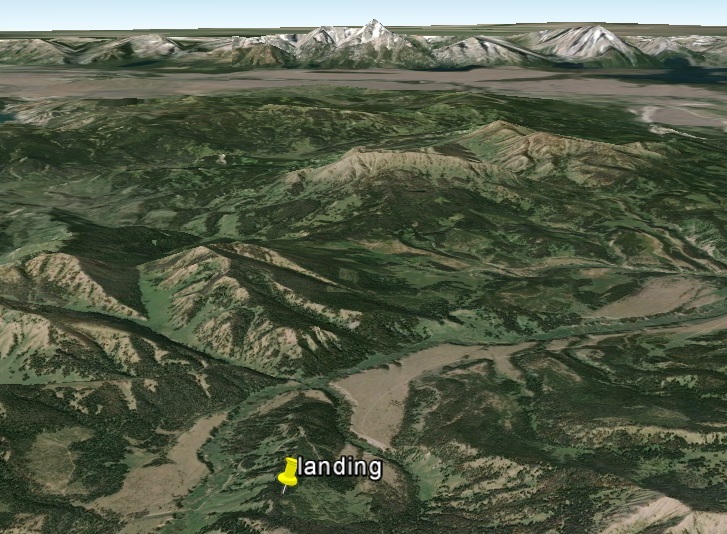 So, it looks like I need to check out the Gros Ventre landslide. 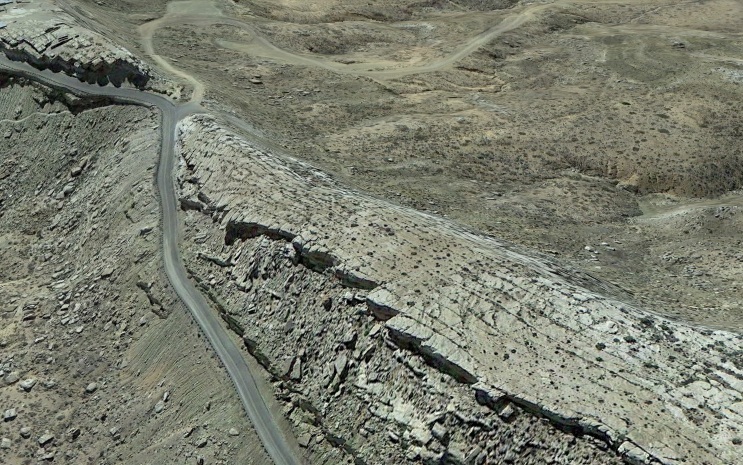 On June 23, 1925, one of the largest fast-moving landslides in generations occurred near the town of Kelly, Wyoming. 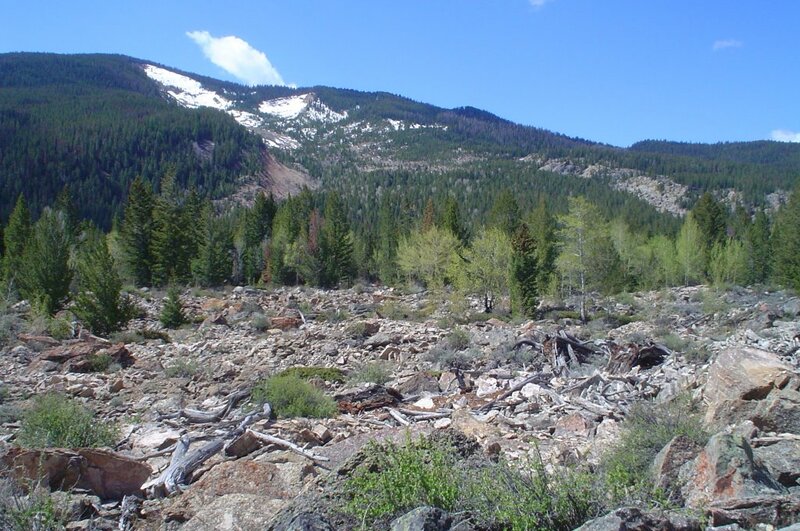 In just three minutes, huge amounts of rock and debris cascaded down the north slope of Sheep Mountain, changing the area forever. Hurling down the slope at 50 mph, the mile-wide slide carried 50,000,000 cubic yards of debris. 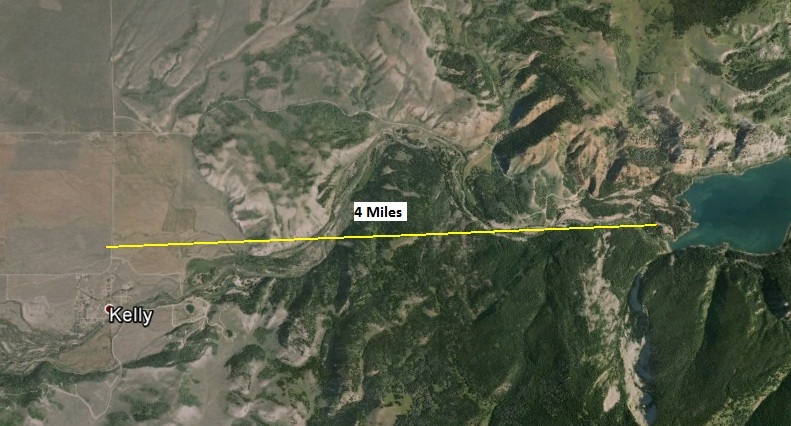 The mass rode 300 feet up the opposite slope, blocked the Gros Ventre River, and formed a five-mile long body of water known today as Lower Slide Lake. 2. The Gros Ventre river cut through the sandstone into the shale. 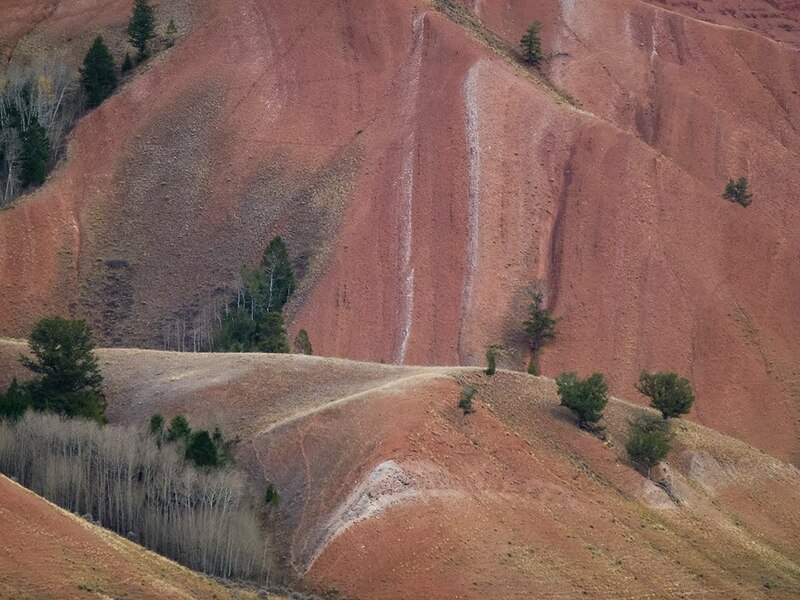 This created an unsupported downslope edge of the sandstone formation. 3. Swampy pools with no outlets on top of the mountain provided an extra source of water to produce the saturating conditions. Earthquake tremors (which were occurring) added to these already unstable factors and could have precipitated a landslide. William Bierer, a long-time native to the area, had predicted a slide in the near future. Convinced of the validity of his theory, Bierer sold his ranch on Sheep Mountain to Guil Huff, an unsuspecting cattle rancher, in 1920. Bierer died in 1923 before his prophecy became reality. 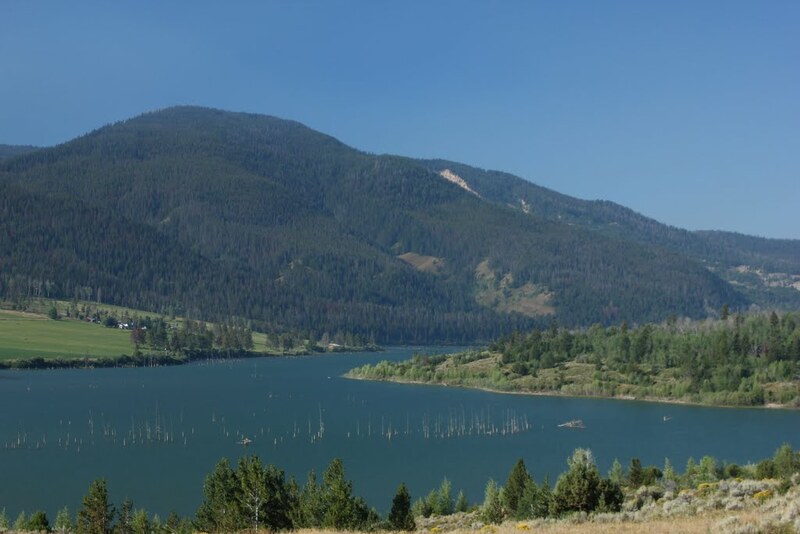 Two years later, on the afternoon of June 23, 1925, Huff rode horseback down the river to the north side of Sheep Mountain where he had heard loud rumblings. 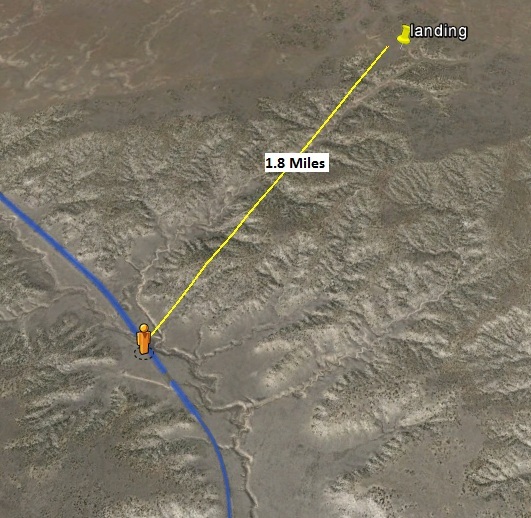 He arrived at 4 p.m., in time to witness 50 million cubic yards of land mass descending rapidly toward him. He and his horse escaped the impact by a mere 20 feet. By June 29, after heavy rains caused the dam to fill and overflow, the Huff house was floating in the lake. A man-made dam has a built-in spillway so that the waters cannot top the dam, erode, and breech it. 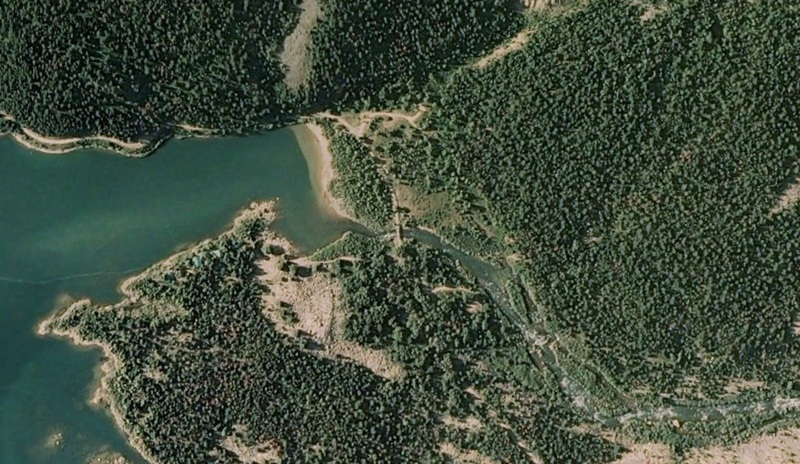 The slide dam, made by nature, was not equipped with a spillway. 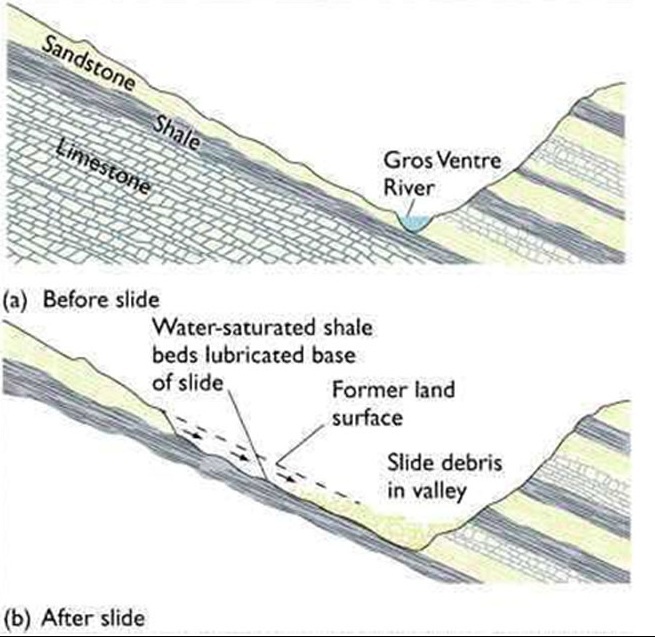 Engineers, geologists, and scientists came to the area to study the slide; they determined that the dam formed as a result of the slide was permanent and safe. Most of the local people accepted that decision and ceased worrying about a possible disaster, especially when the spring runoff in 1926 passed with no major problems. The winter of 1927, however, was one of the most severe ever recorded in the state to that time. 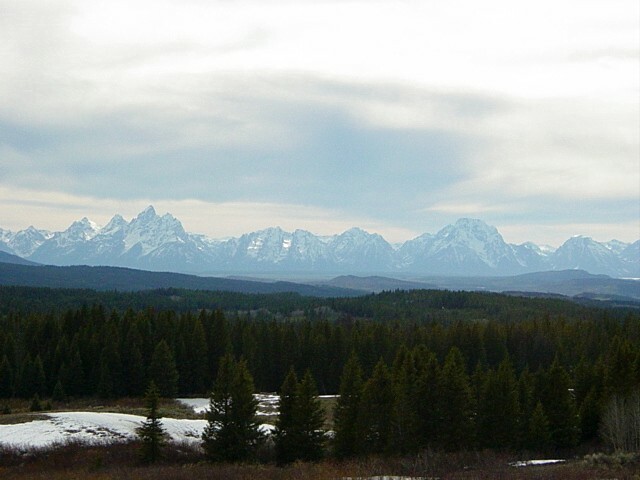 When spring arrived, the unusually deep snowpack melted quickly, aided by days of rain. 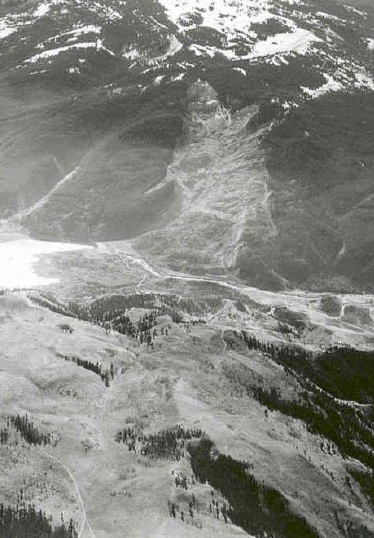 On May 17, water began spilling over the low places of the dam. 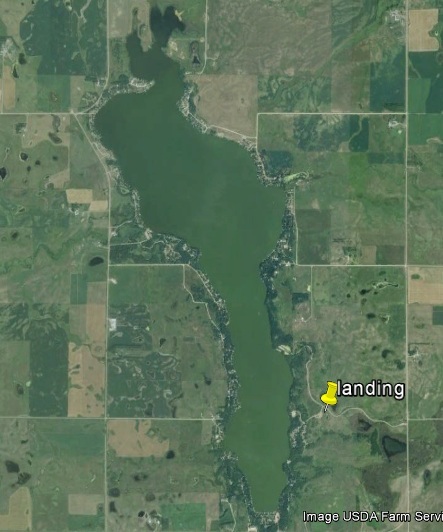 Some local ranchers saw the water rising; they rode up towards the dam and saw that the top 60 feet of the dam had given way under the pressure of the excess water. They turned around and headed for Kelly to warn the residents of the impending danger. By the time they arrived, the people had only 15 minutes in which to flee to safety. Despite the warning, six lives were lost in the tragedy. The little town of Kelly was almost completely obliterated. 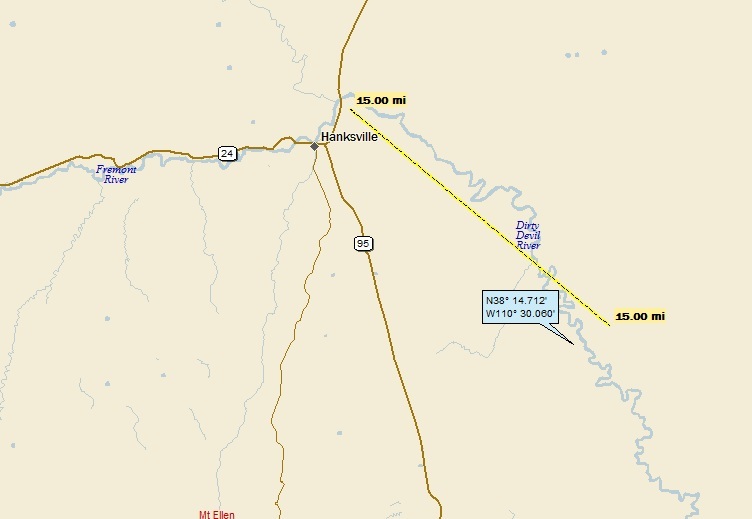 Here’s a GE shot showing that Kelly is only about 4 miles downstream from the lake. I wonder how they managed 15 minutes of warning to the poor folks of Kelly? They must have seen the problem from quite a ways downstream of the dam. But even so – let’s say the flood waters were moving at 20 mph (not unreasonable, could have been faster). At 20 mph, it would only take 12 minutes for the water to travel four miles. Oh, well . . . I can only assume that some smart people have looked at the dam to be sure it’s stable now. But hey, it has been there for 80 some years with no problems . . . . I wonder if the sunken trees are from 1925? Nahhhhh . . . . But really, why would there be trees in the lake if they weren’t from back before the slide??? Landing number 2077; A Landing A Day blog post number 504. Dan – Getting a little serious with a 1/6, thanks to this OSer landing in . . . WY; 73/66; 5/10; 149.6. One more OSer, and I’ll be at 150 even . . . This was my 74th hit for the Snake, which flows to the Columbia (148th hit). Turning around once more, now I’m peaking over the crest of the Tetons, looking east at my landing (the yellow push-pin is faintly visible in the distance). I’ve stumbled on a GE feature that will probably become a regular for my more scenic landings. When using GE StreetView (which I do practically every landing), I “grab” the little orange dude icon on the right hand side of the GE screen, and put him on a nearby road that shows up blue (i.e., the roads with StreetView coverage). 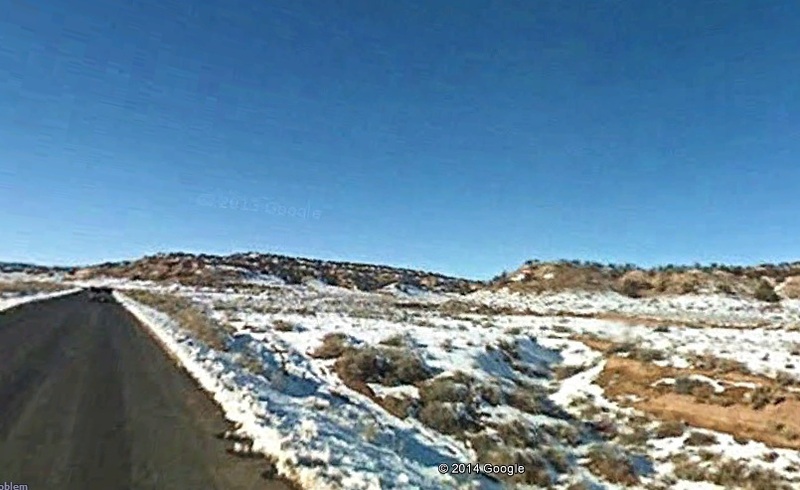 When I let go of the orange guy, I zoom right down to the road, and up pops StreetView coverage. 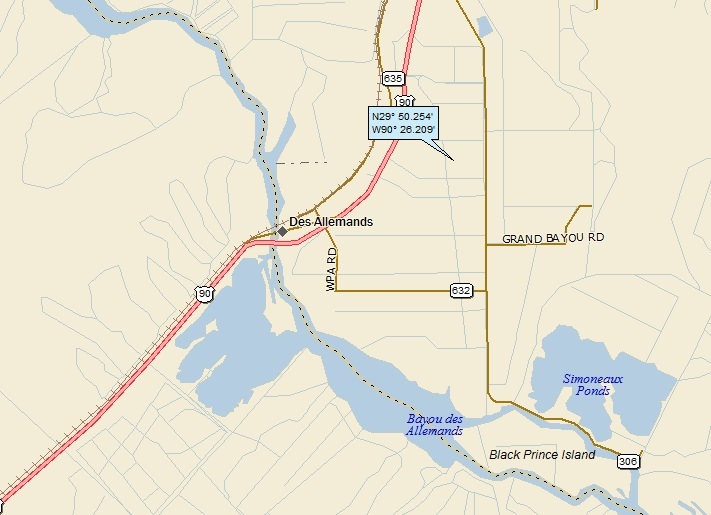 Occasionally, I have missed the blue-highlighted road sufficiently that GE is a little confused, and it gives instead a “ground level view,” close to the road I was aiming for. When this happens, I just zoom back out, and try again for the road. But then it hit me: by putting the orange guy at my landing, I can effectively stand next to my landing and see what one would see if one were standing there. 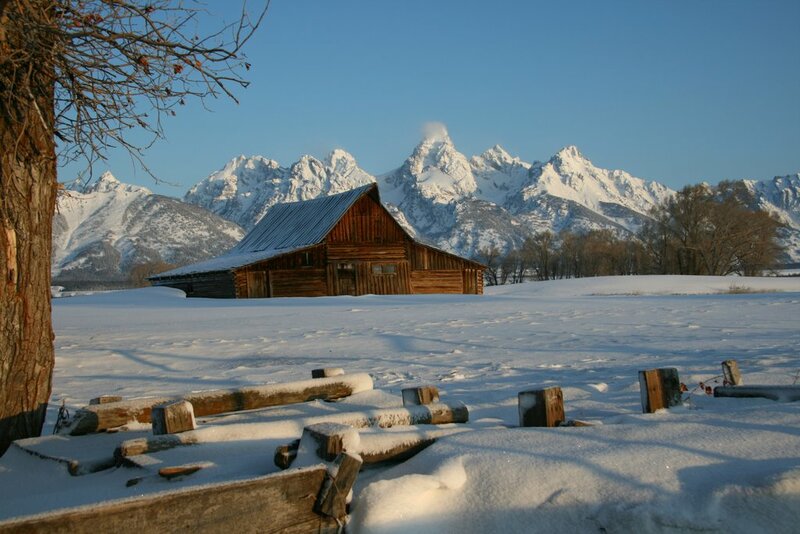 It was David Jackson [a trapper and fur trader] who gave his name to the valley when he supposedly spent the winter of 1829 on the shores of Jackson Lake. 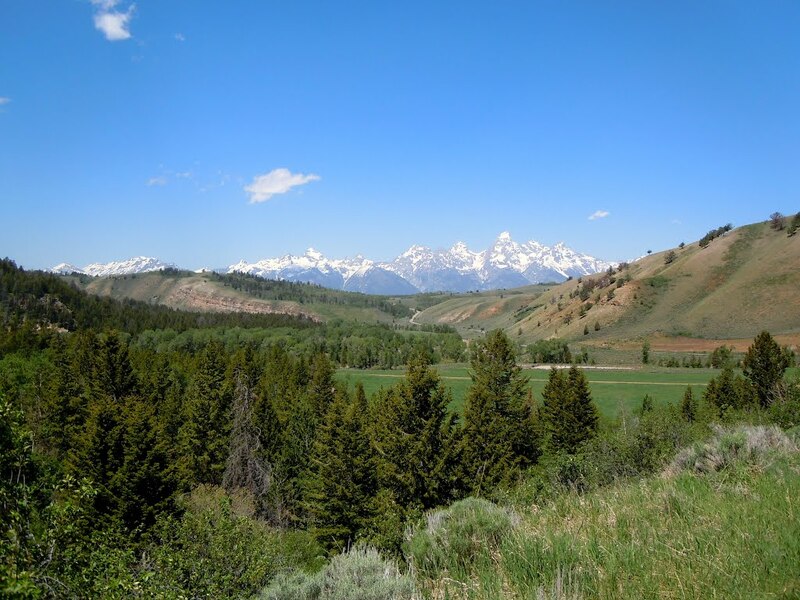 For the mountain men, a “hole” indicated a high valley that was surrounded by mountains, and William Sublette, who was Jackson ‘s partner in an early fur company, referred to the mountain valley along the Snake River as Jackson ‘s Hole. I hope that he thought it was staggeringly beautiful (as opposed to thinking, oh, sh__, another mountain range to cross). 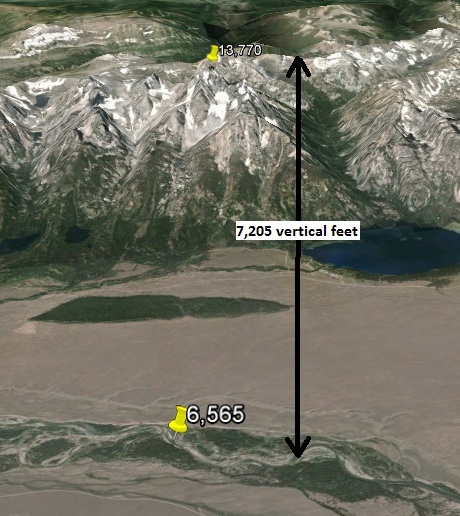 The vertical movement on this fault has so far exceeded five miles (about 30,000 feet). Sounds like a lot, right? Let’s do a little math. 30,000 feet divided by 8 million years = only 0.0038 feet/year (not even 1/16 of an inch!!). Phew. 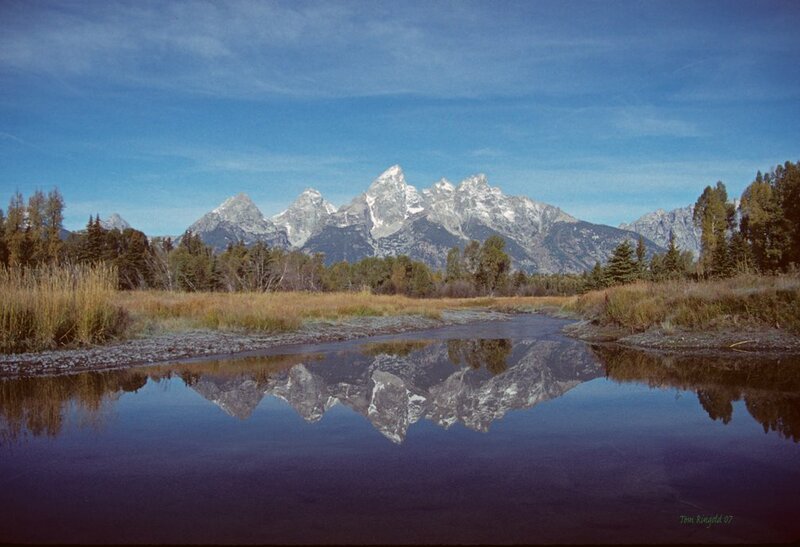 As dramatic as the Tetons are, a movement of less than 1/16th of an inch per year got the job done. Amazing what happens when you have millions of years to play with! 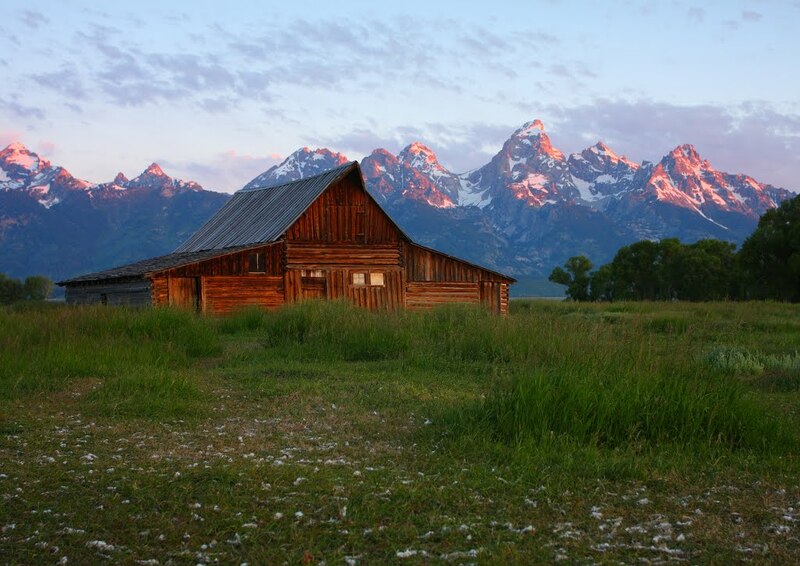 It is generally accepted that we ain’t done yet – that the Tetons will keep on growing! There’s research going on to see if the fault moves only during earthquakes, or if it’s also moving very slowing without earthquakes. I lifted this from the Carleton College (MN) website. 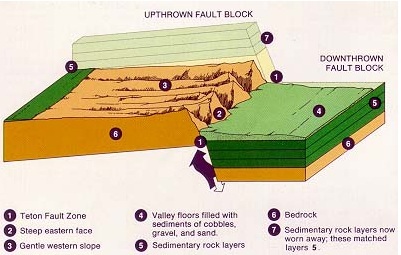 It’s a quiz question for beginning Earth Science students: which number shows a fault scarp? The answer is obviously 2! 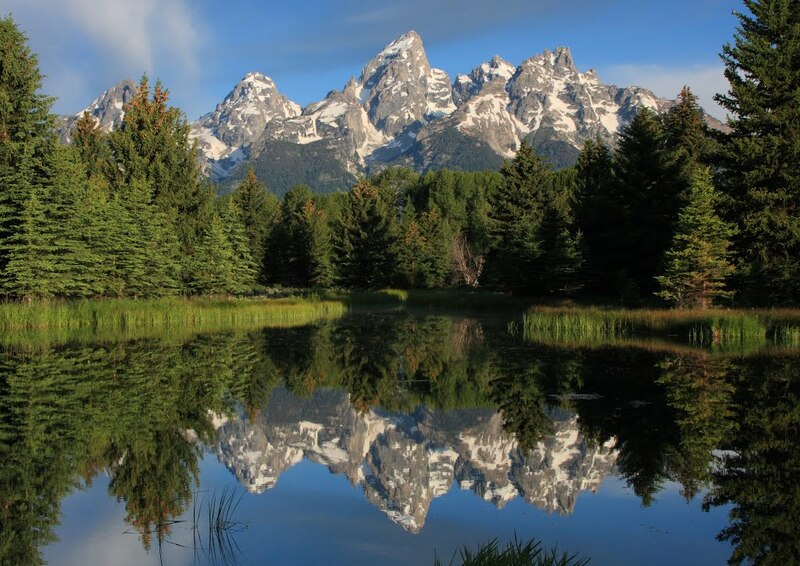 These are the youngest of the Rocky Mountains – not in terms of the age of the rocks (there are some really old rocks, like 2.5 billion-year-old rocks, making up the Tetons) – but rather in terms of how long the mountain peaks themselves have been around. 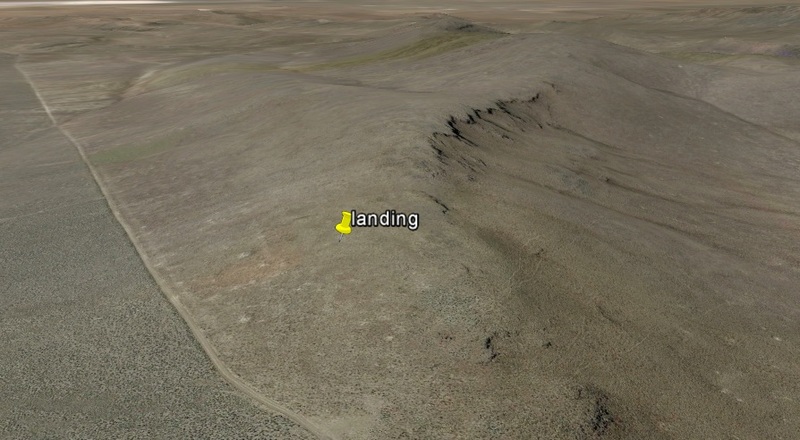 There’s another completely different geology story even closer to my landing! To make sure you don’t get over-geologied in one fell swoop, I’ll give you a four-day breather. That’s right, for the first time in A Landing A Day history, I’m going to do a two-part post for the same landing! But first, some pretty GE Panoramio pictures . . . Landing number 2076; A Landing A Day blog post number 503. Dan – I’m not happy about going 1/5 (but as long as my Score stays below 150, I’m OK), thanks to this OSer . . . SD; 57/52; 5/10; 149.2. 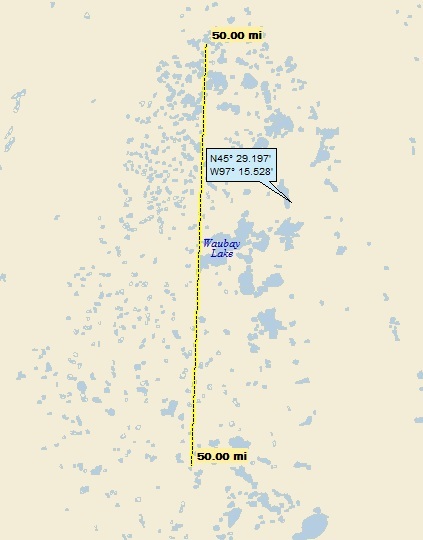 Also not far away is the mysteriously-named “Enemy Swim Lake” (more about that later). 1. 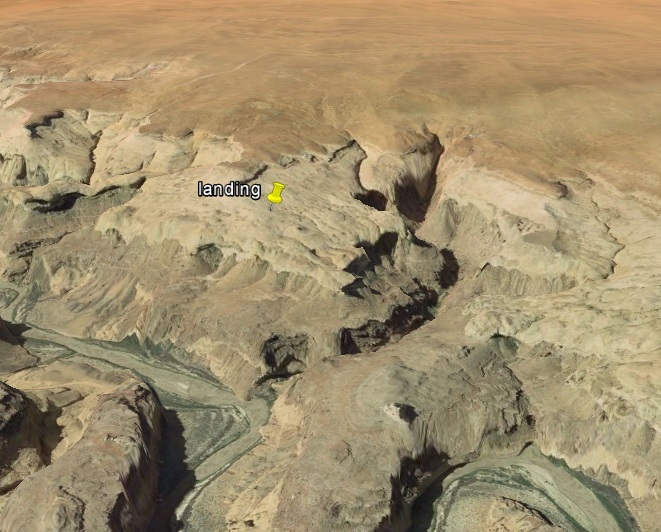 The advancing then retreating glaciers left an inherently irregular surface behind, often resulting in an undulating topography with multiple closed drainage areas (i.e., potholes). 2. 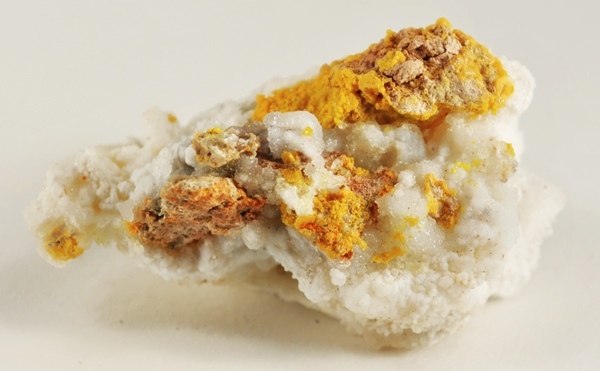 In conjunction with the above, chunks of ice were often left behind by retreating glaciers. These chunks of ice were then covered by soils and sediments deposited by the glaciers. When the chunks melted, a particular type of pothole resulted, known as a kettle. If the kettle is large enough to support a lake, the lake is known as a kettle lake. 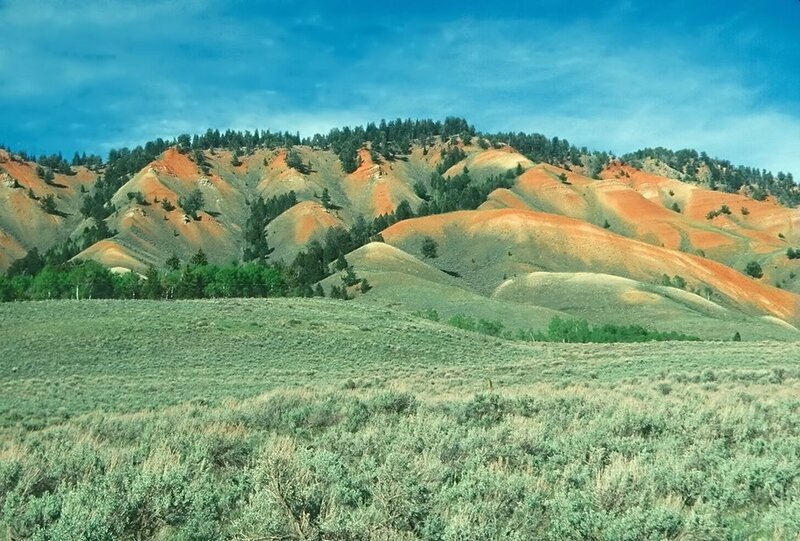 This is a very young landscape, as the glaciers retreated a measly 10,000 years ago. It just so happens that it’s also a semi-arid region, with precipitation averaging just 20” per year (more or less) – much less than the 45” for me here in New Jersey. The result is that typical drainage patterns of small streams leading to small rivers leading to larger rivers just doesn’t exist. There are very few streams; rainfall runoff and snowmelt simply flow into the nearest pothole. If the pothole is dry, some of the water soaks in to the ground and some of the water evaporates. Larger kettle lakes may have very small streams flowing in, but typically don’t have a stream flowing out. 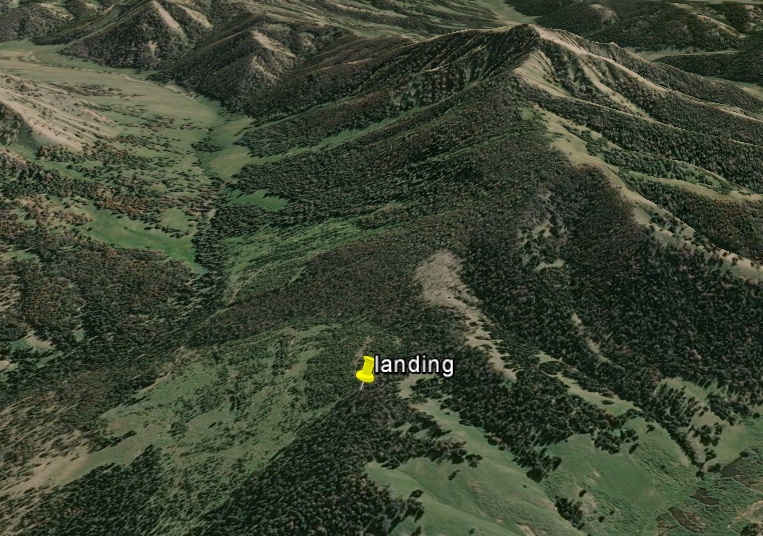 See that teardrop-shaped area just south of my landing? That’s a dry pothole. (The larger dark splotch north of my landing is a wet pothole, aka a pond). Anyway, when it rains, water that falls on my landing ends up in that little teardrop-shaped dry pothole. 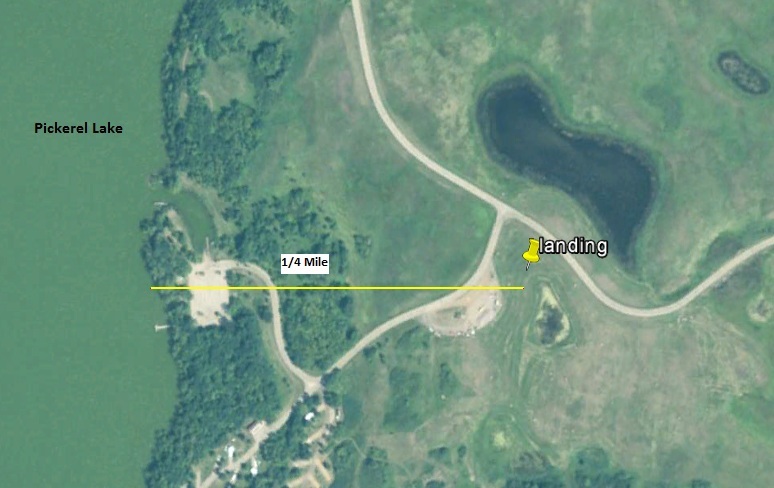 I assume that if a major rainfall occurs (or if there’s a lot of melting snow), that little pothole might overflow and the runoff might make it all the way to Pickerel Lake. Pickerel Lake is a kettle lake with no outlet; so there’s no more drainage to speak of . . .
Indian name—”Tak-ain-wey-api”(Enemy Swim). There are several versions of its name origin; this one came from Abe Crawford, Felix Rondell and John One Row: In 1812, a band of Sisseton Sioux were camped on the south bank of the lake. A band of warring Cheyennes came from the north, and were looking for a scrap with their enemies the Sioux. They ran into the camp of the latter, a battle took place, and the Sioux got the best of them. To save themselves the Cheyennes took the water, and swam across the lake. Before moving on, I guess I have to say something about the titular town of this post, Grenville. 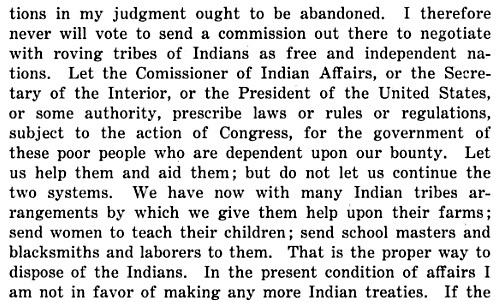 After some digging, I found Volume 9 of “South Dakota Historical Collections.” Here is an excerpt of a debate among some SD politicos (that I believe occurred in 1864) about how to deal with the Indians, so when “the President” is mentioned, it’s Lincoln. It’s worth the read . . . 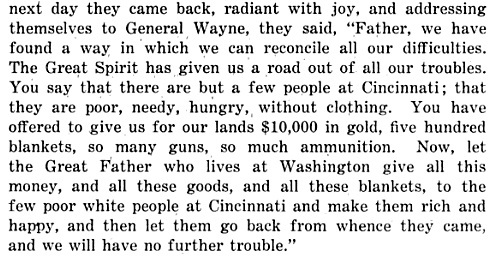 The guy talking (a Senator Sherman) was a realist. 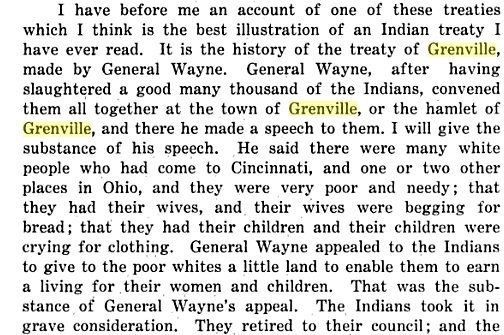 He realized that the treaties were worthless, and if we want to help the Indians, we need to do it with legislated aid, not more treaties that would inevitably be broken . . .
Hmmm, thought I. This is familiar territory. In fact, it made me hearken back to one of my favorite posts, Doran MN (posted on June 10, 2009). 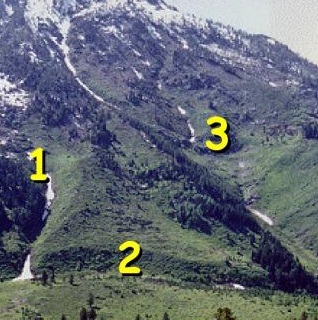 This post featured some very unique hydrology going on in the vicinity of Browns Valley. Here’s a map, showing “Lake Traverse” which is a headwaters lake for the Red River (a tributary of which flows north out of Lake Traverse). The Red River continues north, eventually discharging into the Nelson River and then Hudson Bay. A little bit downstream, the Little Minnesota flows into big Stone Lake. From there, the Little Minnesota flows to the Minnesota which flows to the Mississippi. 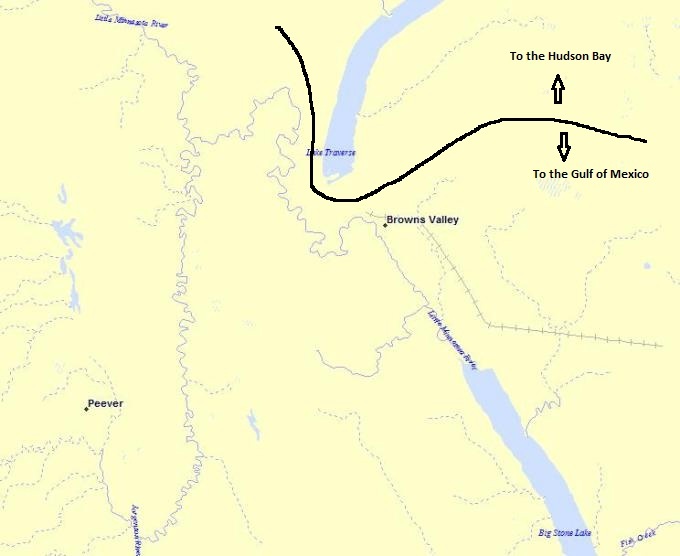 So right there near the town of Browns Valley is a significant watershed divide, with water either going to the Hudson Bay or to the Gulf of Mexico!! 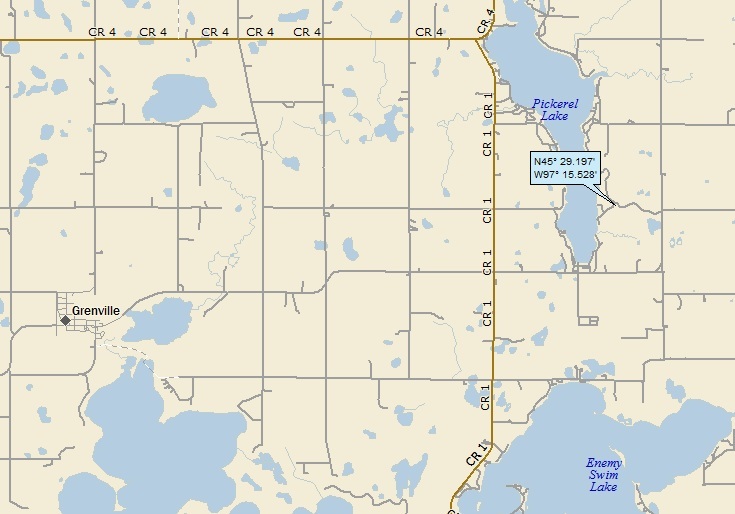 What’s fascinating is that the land between the Little Minnesota and Lake Traverse is pretty much flat. 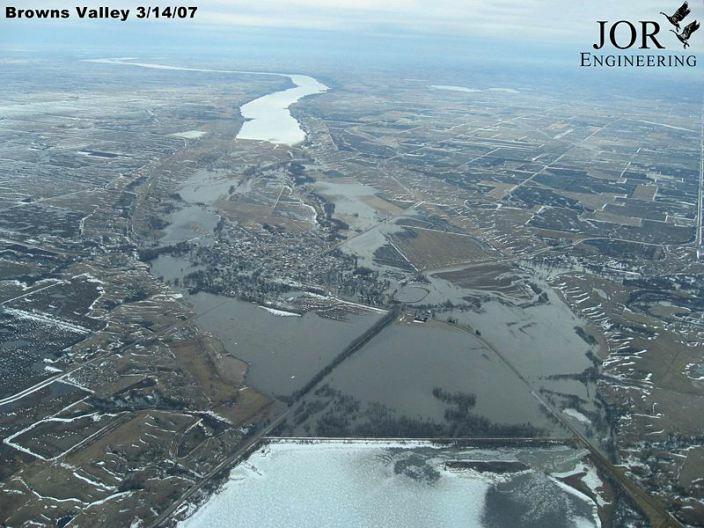 Check out this picture that shows the flood of March 2007. We’re looking south from Lake Traverse in the foreground towards Big Stone Lake. 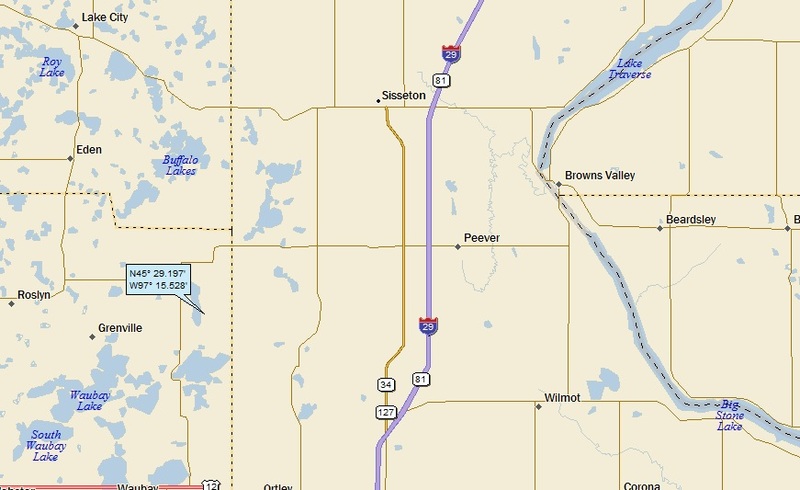 The flooding you see (south of Lake Traverse) is from the Little Minnesota. Look carefully, and you’ll see that water’s coming into Lake Traverse from some kind of opening under the highway (a little way in from the lower right corner of the photo). Think about it!! 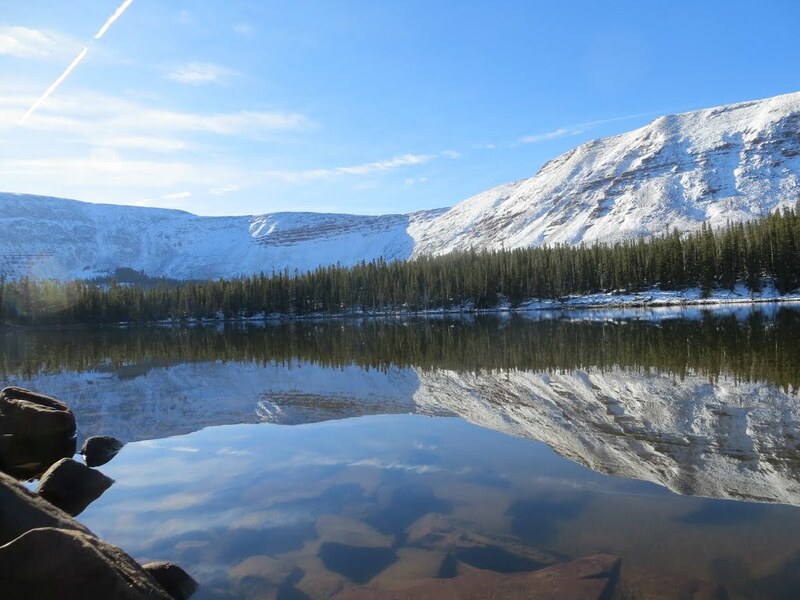 At that moment, the continental divide is actually within a body of water!! So, two adjacent water molecules might be flowing down the flooded Little Minnesota. 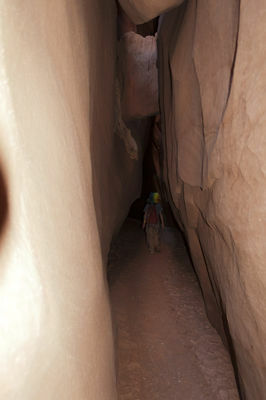 They just happen to flow toward the passageway into Lake Traverse. As fate would have it, one molecule hangs a left ends up in Hudson Bay; while the other stays straight and ends up in the Gulf of Mexico. Very cool. Very cool, indeed . 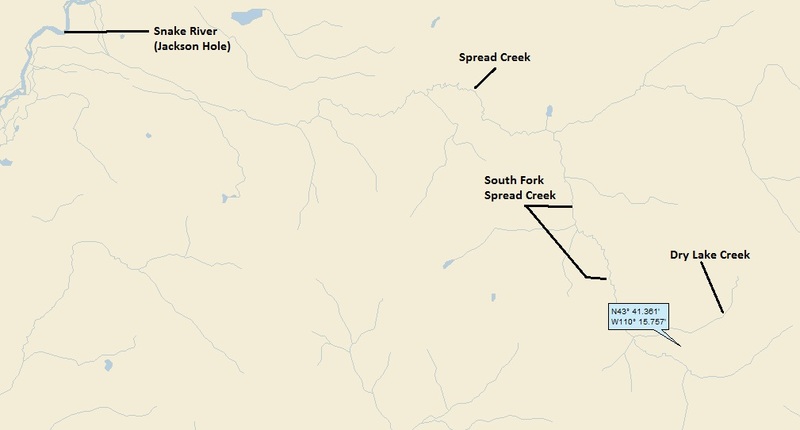 . .
Moving right along: I’ve read that the Red River of the North has a relatively flat gradient, which makes the river sluggish, and more susceptible to flooding. I also read that the gradient is getting progressively even flatter, because of isostatic rebound. Isostatic rebound is the phenomenon whereby the land surface actually raises when the load of glacial ice is removed. Even though the glacial ice left 10,000 years ago, isostatic rebound is continuing today. Because the glaciers were thicker and lasted longer further north, the land further north is rebounding more. Therefore, the river gradient is getting progressively flatter. Imagine if isostatic rebound were to continue indefinitely. It could be imagined that the Red River (or at least parts of it) could begin to flow south, joining up with the Little Minnesota. My oh my, what hydrological havoc!!! Disclaimer: I strongly suspect that hydrologists have looked at this and have concluded that it won’t happen. I just found it fun to think about . . .
And there is yet one more geological problem that is playing out in the background of the flooding: Canada is literally rising. 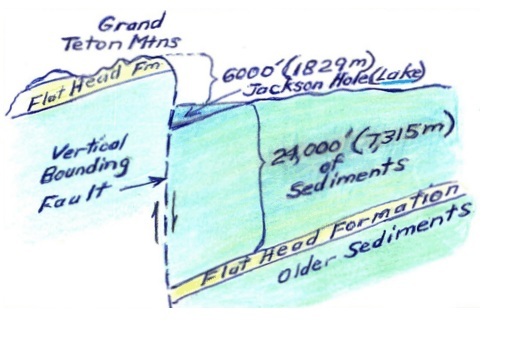 “The weight of the glaciers depressed the surface of the Earth and since the glaciers receded, the land to the north has been rising,” Thorliefson [Harvey Thorliefson, head of the Minnesota Geologic Survey] said. The ice sheet that covered Canada was more than 2 miles thick. When it melted starting about 12,000 years ago, the land that had been under the ice quickly rose, or “rebounded,” almost 1,000 feet. In the intervening 10,000 years or so, it has risen another 1,000 feet and, according to Thorliefson, still has another 650 to 1,000 feet to go. Why that matters is that the Red River flows downhill into Canada, and the bottom of the hill is rising. The river has already lost 50 percent of its gradient, Thorliefson said, and will lose more over the next few thousand years. It won’t be enough to make the river reverse direction and flow south, but it will slow the already-slow river even more, thus increasing the danger from floods. “It will become gradually more sluggish,” he said. Phew! I’m hydrologically and geologically exhausted. There you have it. 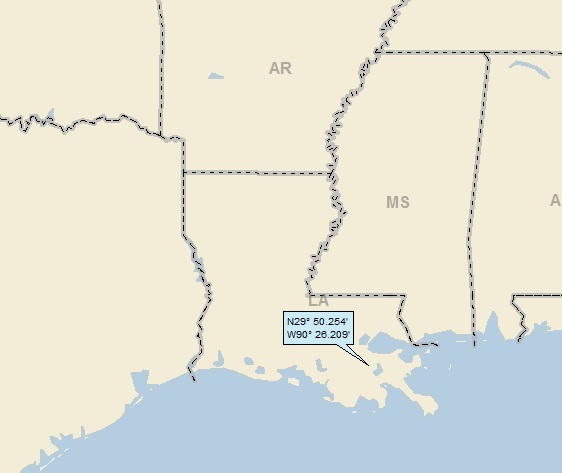 I particularly like where the two water molecules were traveling together (mere microns apart), but were torn asunder and ended up separated by 2,000 miles – the distance from the Hudson Bay to the Gulf of Mexico . 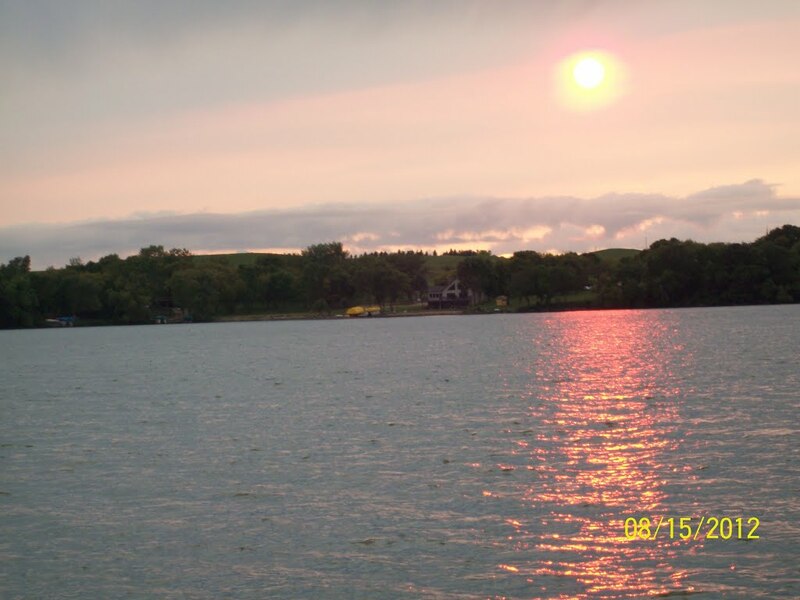 . .
I’ll close with a Panoramio shot (by WeFish) that was taken from the eastern shore of Pickerel Lake (very close to my landing). We’re looking across the lake at the setting sun . . . Landing number 2075; A Landing A Day blog post number 502. Is any of this familiar? If you’re a regular reader, it should be. 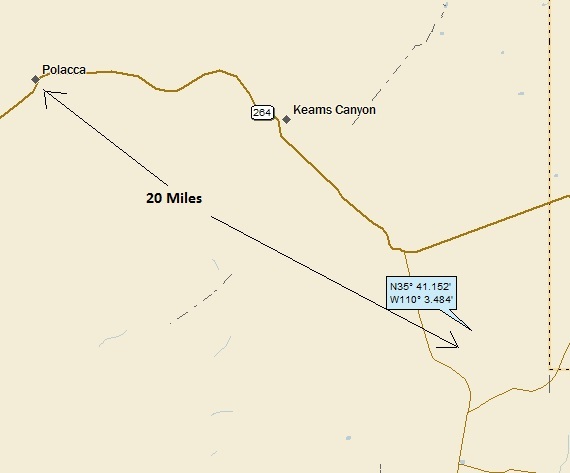 Landing 2047 (posted August 28th and entitled “Orovada, Nevada) was 25 miles south of McDermitt, as opposed to 25 miles north for this landing. 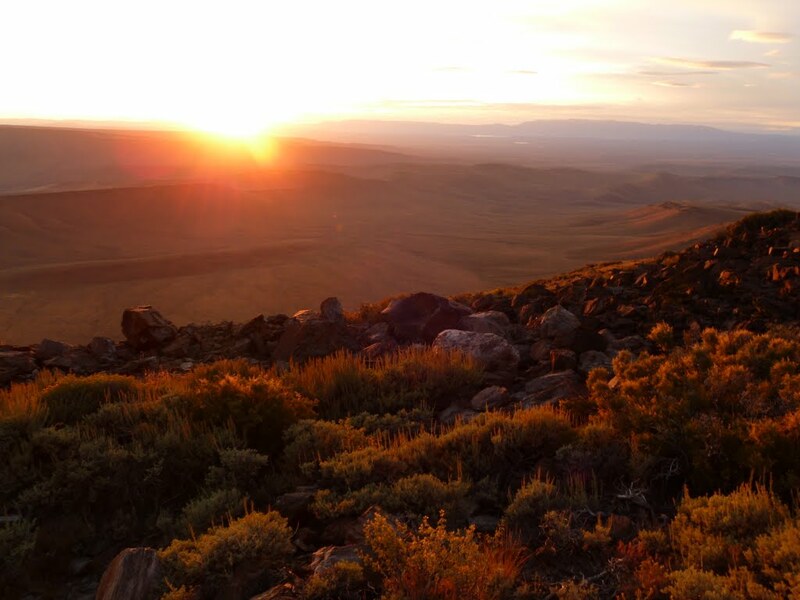 That post featured McDermitt more than Orovada (more about McDermitt later). You can see that I landed near a ridge top. By the way, we’re looking north, and as you can see, the drainage heads west and northwest. 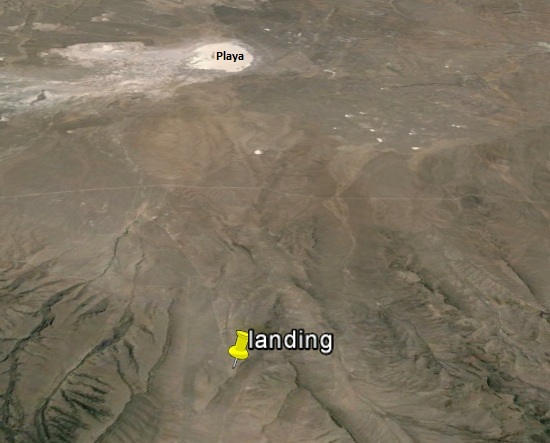 Backing up (and still looking north), you can see that the rare drop of water that lands on my landing spot basically heads north, but gets stranded in the playa (a dry lake bed with no outlet). Here’s a very cool GE panoramio shot by PNPLibi, taken from a point about halfway between my landing and the playa. I believe that we’re looking north, and the light splotch on the right side of the photo in front of the mountains might be the playa itself! 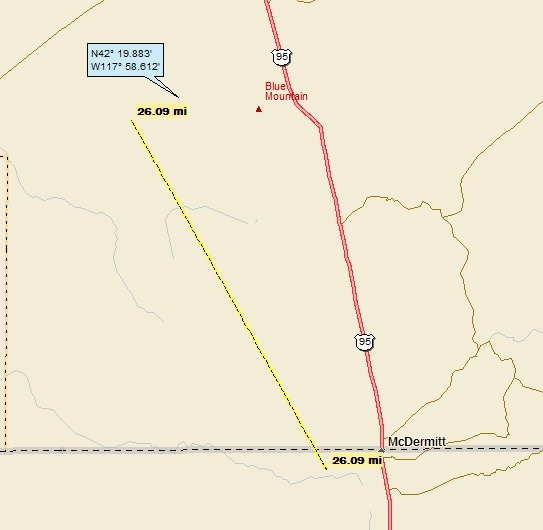 McDermitt straddles the Nevada–Oregon border. 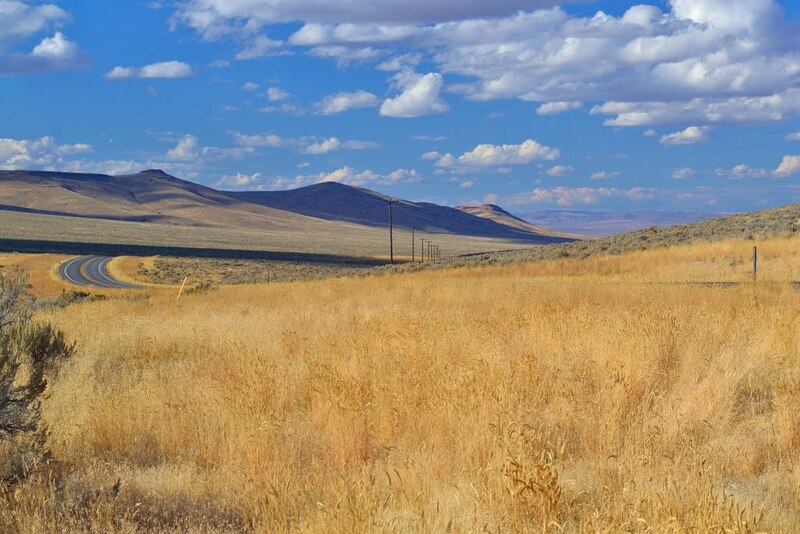 McDermitt’s economy has historically been based on mining, ranching and farming, although the last mining operation closed in 1990, resulting in a steady decline in population. 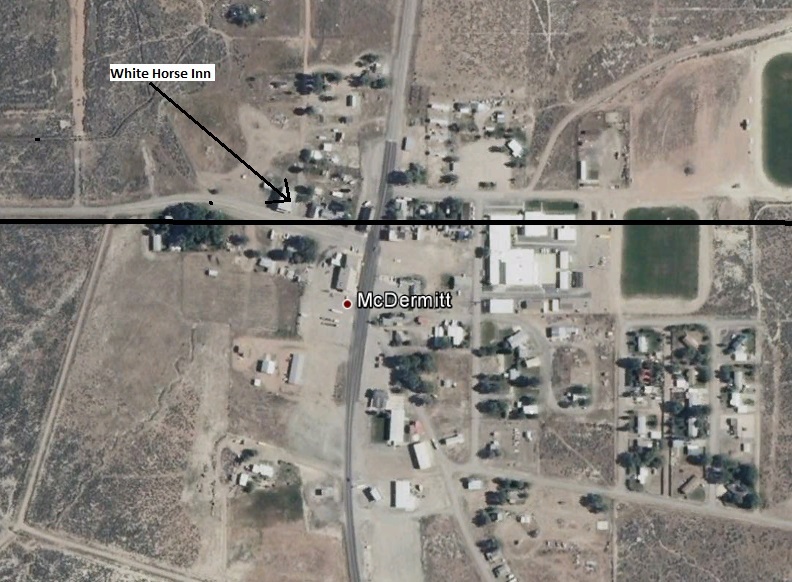 Here’s a GE shot with the White Horse Inn and the State Line marked out. Well, the line almost goes through the building . . . The community, originally called Dugout, was named after Fort McDermit, which in turn was named after Lt. Col. Charles McDermit. It is not known why there is a discrepancy in the spelling. 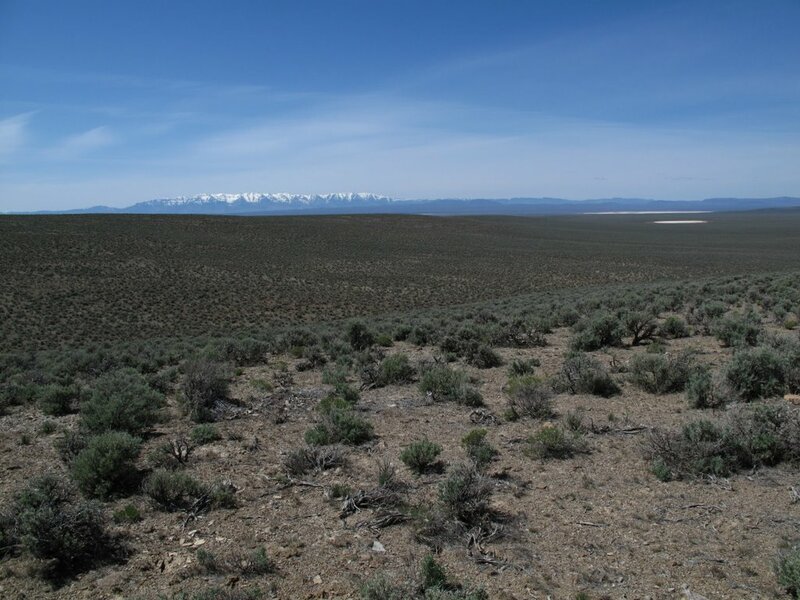 Here’s ALAD’s take on the extra “t” in McDermitt: One of the most powerful and persuasive members on the town-naming committee absolutely never cursed, and strongly frowned on the practice. He thought that “Dermit” was two close to “damn it.” Adding the extra “t” added a little extra distance between the town and the curse . 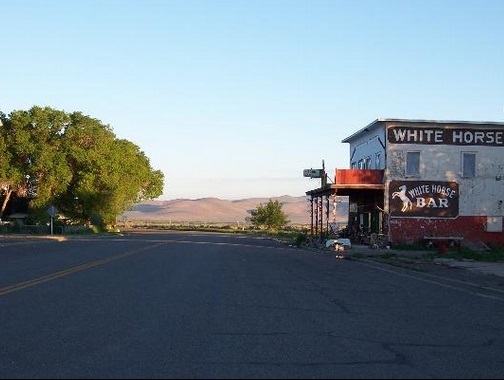 . .
Dugout / McDermitt joins a list of ALAD communities where I would prefer the original, more colorful town name. My regular readers probably expect that I would now post this so-called list. OK, OK, so maybe I don’t keep track of absolutely all things landing. I must admit that I feel a little ashamed to so wantonly steal from a previous post. Oh, well . . . Anyway, here’s a GE Panoramio shot from the top of Blue Mountain about five miles east of my landing (check out my closer-in landing map). Since we’re looking west, my landing is pretty much in front of the sun somewhere out there. . . . Landing number 2074; A Landing A Day blog post number 501. 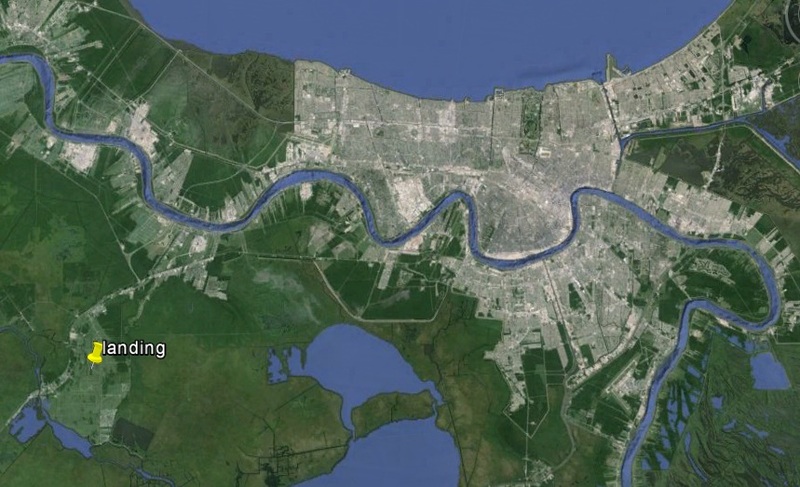 You can see that the Bayou Des Allemands flows right through the town, and of course, that’s my watershed. 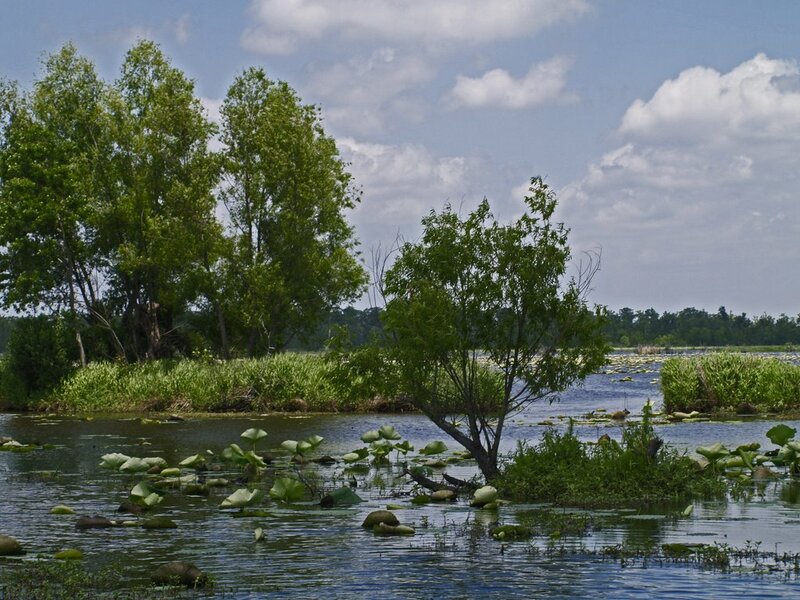 The Bayou Des Allemands flows to the Bayou Perot, which makes its way to the Gulf of Mexico. In my judgment (and mine is the only judgment that matters), neither of these Bayous make it to “river” status. 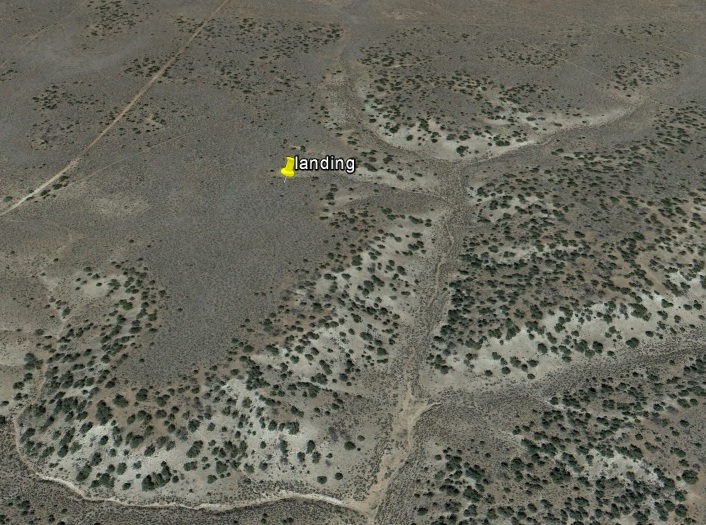 My Google Earth (GE) shot shows what appears to be a farm field of some sort. Rice? I haven’t a clue. I love the way the MM snakes its way along . . .
“Des Allemands” means “of the Germans” in French. 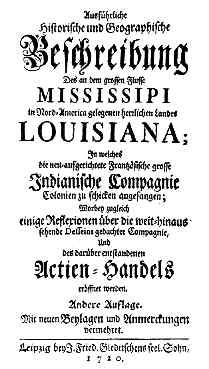 Des Allemands was settled in 1721 by immigrants to the colony of Louisiana from Germany under the leadership of John Law and the “Company of the Indies”. The German Louisiana colony was originally up the Mississippi River in what is now Arkansas, but experienced hostility from the local Native Americans in that area, and moved to a location much closer to the colonial capital of New Orleans. 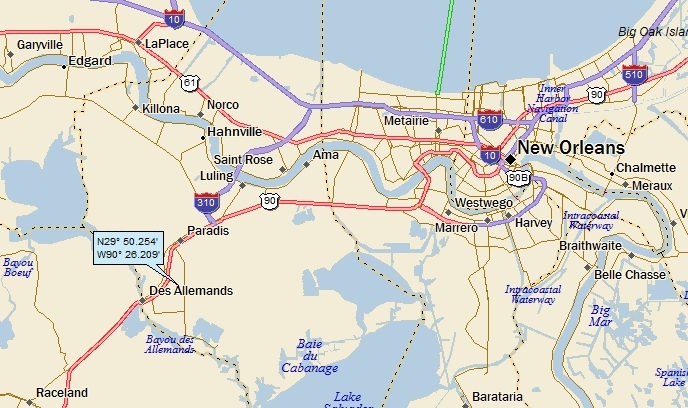 The German Coast (French: Côte des Allemands) was a region of early Louisiana settlement located above New Orleans, primarily on the east side of the Mississippi River. When John Law’s Company of the Indies folded in 1731, the Germans became independent land-owners. Despite periodic flooding, hurricanes, and the rigors of frontier life, the German pioneers made a success of their settlements. Their farming endeavors provided food not only for themselves but also for New Orleans’ residents. Some historians credit these German farmers with the survival of early New Orleans. From the time of their arrival, the German immigrants began speaking French and intermarried with the early French settlers. Over the subsequent decades they intermarried with the descendants of the latter as well as the Acadians. Together with other settlers, they helped create Cajun culture. For example, German settlers introduced the diatonic accordion to the region, which become the main instrument in Cajun [and Zydeco] music. The German Coast was the site of the largest slave revolt in US history, the 1811 German Coast Uprising. Leaders were Quamana and Harry, slaves, and Charles Deslondes who gathered an estimated 200 slaves from plantations along the River Road and marched toward New Orleans. During their two-day, twenty-mile march, the men burned five plantation houses (three completely), several sugarhouses, and crops. They were armed mostly with hand tools. White men led by officials of the territory formed militia companies to hunt down and kill the insurgents. The initial battle was brief. Within a half hour of the attack, 40 to 45 slaves had been killed. The remainder slipped away into the woods. Over the next two weeks, white planters and officials interrogated, tried and executed an additional 44 insurgents who had been captured. Executions were by hanging or decapitation. Whites displayed the bodies as a warning to intimidate slaves. The heads of some were put on pikes and displayed at plantations. Phew. A Landing A Day has been presenting some rather graphic violence during my latest posts. First, the Fetterman Massacre (my Story, WY post), then the Hay Meadow Massacre (my Hugoton KS post), and now this . . . In 1975, Gov. Edwin Edwards signed a proclamation declaring Des Allemands the Catfish Capital of the World, and in 1980, the Legislature passed a resolution naming it the Catfish Capital of the Universe. Des Allemands will honor the king of its fishing industry June 21-23. Admission and parking are free. Pay-one-price rides, games, food, a country store, a quilt raffle, a plant booth and craft booths will be open throughout the weekend. A catfish-skinning exhibition will be June 22 from 2:30 to 3 p.m. and June 23 from 2 to 2:30 p.m.
Louisiana Road House (Swamp Pop / oldies). Catfish platters, boats, po-boys and sauce piquante will be served, as well as seafood gumbo, hamburgers, hot dogs, french fries and other foods. Very cool. I’d love to go to the 2014 festival (June 20 – 22). I can just about guarantee that both the music and the food are great! But I had to learn a little more about the music, particularly “Swamp Pop.” In spite of 40 or so trips to Louisiana (primarily New Orleans), I’m not familiar with Swamp Pop. As children, swamp pop musicians listened to (and often performed) traditional Cajun music and black Creole (zydeco) music, as well as popular country and western (hillbilly) songs. In the mid-1950s, however, like other American youths, they discovered the alluring new sounds of rock and roll and rhythm and blues artists like Elvis Presley and Fats Domino. As a result, these teenaged Cajuns and black Creoles stopped playing Louisiana French folk music and instead began to sing rock and roll and rhythm and blues compositions in English. At the same time, they switched from folk instruments like the accordion, fiddle, and iron triangle to typical rock n’ roll instruments: the electric guitar and bass, keyboards, saxophone, and drums. I can just imagine all of those two-steppers out on the dance floor . . . I actually really like the video! A little internet research shows that the lead singer is Terry Gajraj, “the premier Chutney / Soca / Reggae singer and musician from the Caribbean.” OK, OK, so he didn’t play at the Catfish Festival. But I still don’t know who Stanley Mann is (but I’m glad I stumbled on Mr. Gajraj. Landing number 2073; A Landing A Day blog post number 500. Dan – Before I slip into my accustomed posting mode, take a second to read the sentence just above. There it is: A Landing A Day blog post number 500!! Back to the usual . . .
I’m still below 150 in spite of my second OSer in a row, thanks to this landing in . . . KS; 60/56; 7/10; 149.0. When faced with multiple titular candidates, I do my usual slew of Google searches, looking for the oft-elusive hook. 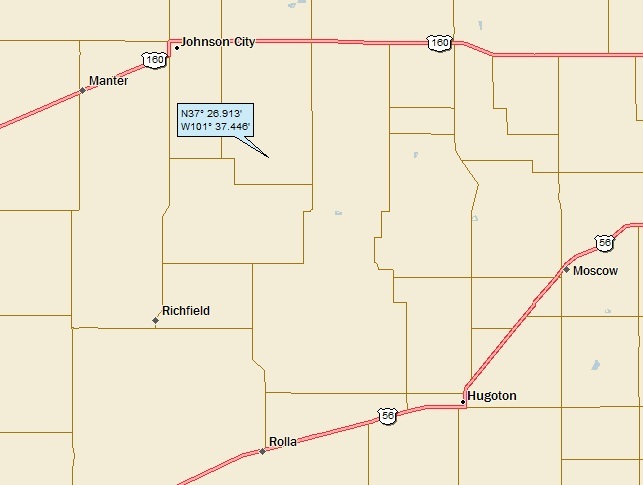 I spent the most time looking at Johnson City (it being the closest and all), but the winner (obviously) was Hugoton. 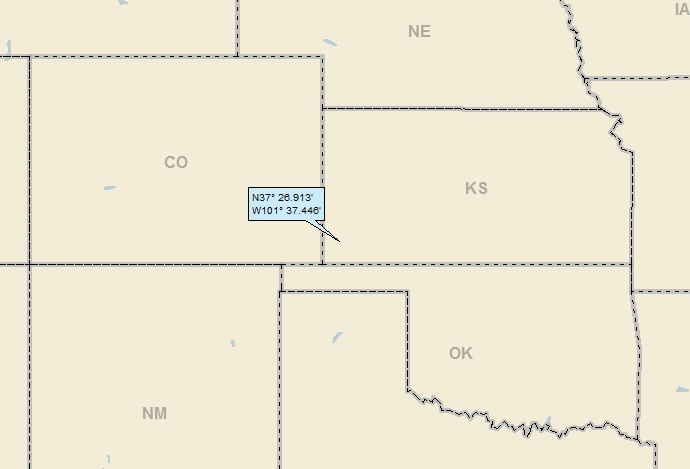 Before moving on to Hugoton, we all need to know what watershed I landed in. 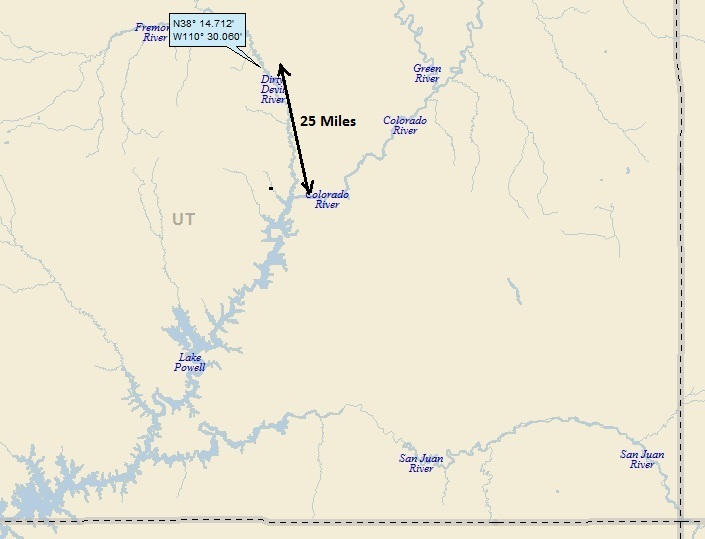 As it turned out, it was tough to figure out which way the drainage went: northeast towards the Arkansas, or southeast towards the Cimarron. 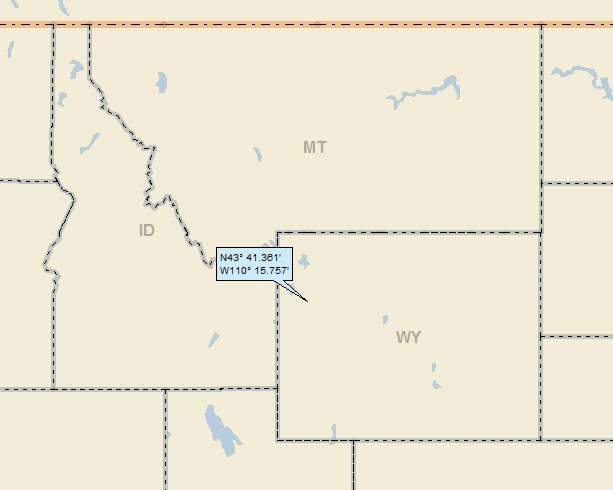 After futzing around for a while with the GE elevation tool, the winner was the Cimarron (14th hit); then, on to the Arkansas (112th hit), to the MM (816th hit). What made it tough is that it’s very flat and quite dry, so I could find no streams to follow . . .
Settlers from McPherson, Kansas established a settlement in what was then west-central Seward County, Kansas in 1885. They originally named this settlement Hugo in honor of French writer Victor Hugo. 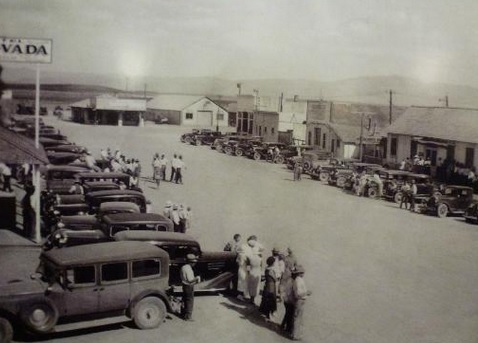 However, the town changed its name to Hugoton to distinguish it from Hugo, Colorado. In 1886, the Kansas Legislature established the surrounding area as Stevens County, and Gov. John Martin designated Hugoton as the interim county seat. This set off a violent county seat war with nearby Woodsdale. 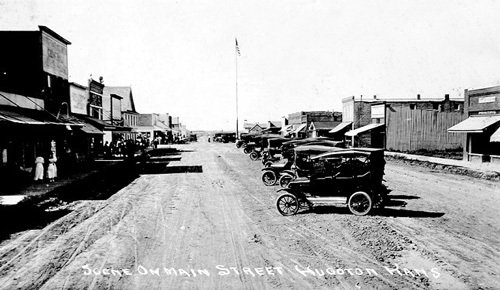 Hugoton became the permanent county seat in 1887, but the conflict continued, culminating in the Hay Meadow Massacre. Are you kidding me? A “county seat war,” culminating in the Hay Meadow Massacre? Oh my, I’ve developed quite the Google itch needs scratching . . . 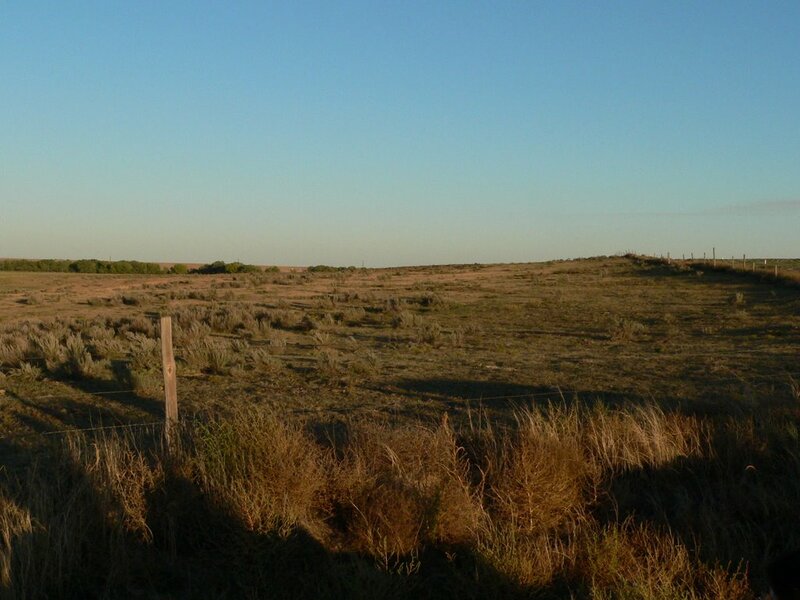 The Hay Meadow Massacre, July 25, 1888, was the most violent event of the Stevens County, Kansas, county seat fight. In July 1888, Sam Robinson, the marshal of Hugoton and a group of men supporting Hugoton for the county seat planned an outing in No Man’s Land just south of the county (what later became the OK Panhandle). Ed Short, the marshal of Woodsdale and Woodsdale supporter, learned of the outing and gathered some men of the opposing faction. They caught up with Robinson, Robinson eluded them. Short, feeling they needed more help, sent for reinforcements. Sheriff John M. Cross, also a Woodsdale booster, and four others headed out to search for the Hugoton party. Not finding them, they camped for the night on a hay meadow at Wild Horse Lake. Meanwhile, Robinson’s friends had organized a group of Hugoton supporters with the intentions of rescuing him. They met Robinson and returned to the strip. Locating the Woodsdale camp at the hay meadow, they surrounded the meny and killed four of them and injured the fifth. 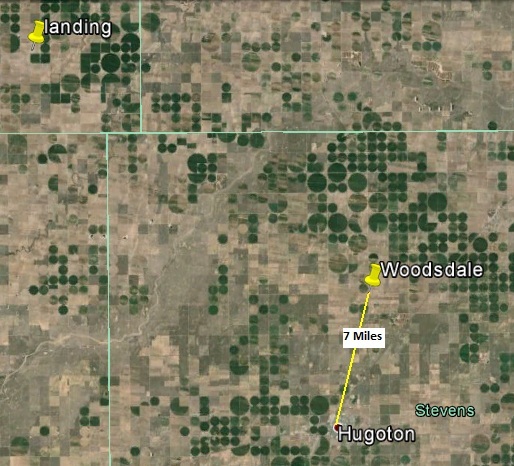 The Hugoton party, believing they had killed all of Woodsdale group, returned, saying that they had killed the party in a shootout. However, the surviving member and a group of haymakers that witnessed the event stated that the Woodsdale party had been captured, disarmed, and then executed. The state militia was called out and the Hugoton men arrested, but it was soon determined that no court had jurisdiction in No Man’s Land. Eventually the case was tried before the United States Court for the Eastern District of Texas. Seven men were convicted of murder and sentenced to death. On appeal, however, the Supreme Court held that the Paris court had no jurisdiction and no sentence was carried out. Not long after Cross and his men had settled in for the night (near two of the haystacks in the meadow), Robinson and his band of men arrived at the Haas camp and abruptly awakened the lot. The Cross posse had not expected any trouble during the night and only one or two of the men were able to reach a gun, but seeing that they were outnumbered they did not fire. All weapons were taken from Sheriff Cross and his men. It is reported that as Robinson slowly raised his rifle he said, “Sheriff Cross, you are my first man” and coldly pulled the trigger. 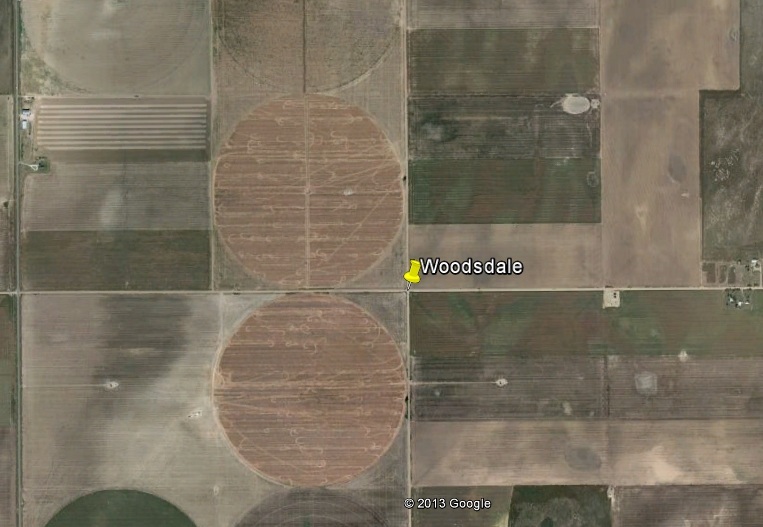 After killing the Sheriff, Robinson and his men fired their guns pointblank into each of the unarmed Woodsdale posse. After the men had been gunned down, matches were lit and held to their faces to confirm their death. Some of the victims were shot a second time. When confident that all of the Woodsdale men were dead, Robinson and his posse left the bodies of Sheriff Cross and his four men as they fell. One of the posse, Herbert Tooney had been shot through the neck but was still alive. He had feigned death so well that he had not been shot again. After he was confident that all had left, he began to move about and check his companions, but found no sign of life. Tooney slowly made his way to his staked horse and with great effort he mounted the animal. After riding a few miles, the 19-year old wounded man came upon an old “buffalo wallow”. His desperate condition prompted him to dismount and lie down in the muck. A few minutes in the sludge renewed his hope to survive. Tooney got back on his horse and continued riding north. And this all happened because some pumped up dudes’ egos were out of control ABOUT A STUPID COUNTY SEAT!!!!! AYKM?? No need to wonder why mankind is always at war . . .